Please be advised that the Oconto County ATV trails will not open April 27, 2019 as allowed by ordinance due to the annual spring thaw. This closure includes the Nicolet State Trail System. Please check the County website www.co.oconto.wi.usor the Oconto Tourism site www.ocontocounty.org for up-dated trail condition information. Trails will open once they are dry enough for use without damage. Another press release will be sent out when trails open. All Oconto County Snowmobile Trails are CLOSED. Let's hope for another great season next year. It's 21 degrees in beautiful downtown Townsend this morning. If you do venture out, beware there is 2?-3? of water across the grade across the street from the Shell Station. These are unpredictable riding conditions. We will need to assess how much flooding has occurred. Grooming operations have ceased at least until further notice!! We have a very thick base on the trails. The long range forecast doesn't look good though. The rest of Oconto County Snowmobile Trails are closed. 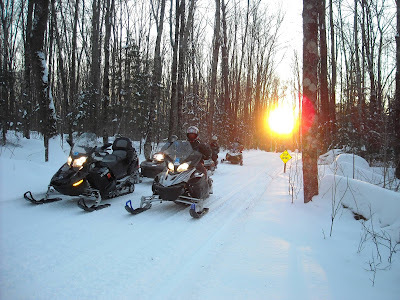 ALL OCONTO COUNTY SNOWMOBILE TRAILS WILL CLOSE ON SUNDAY, MARCH 24, 2019 at MIDNIGHT. It's 44 degrees in beautiful downtown Townsend this morning, with fog and rain last night and this morning. We lost a lot of snow overnight. Please stay off the trails for now to minimize any damage from sleds. Grooming operations have ceased at least until further notice!! More rain is in the forecast for all day today and into tomorrow morning. If it were to turn cold again, we have a very thick base on the trails. The long range forecast doesn't look good though. The rain and warm temperatures are taking a toll on what were the best tails we had in years. There is a good base yet if the temperature drops this weekend. If at all possible stay off the trails until it cools down to extend the season a little longer. Chute Pond Trails are open, in late season condition. There may be some bare spots, some standing water, and some icy areas. There is no grooming scheduled at this time- we're waiting to see how things freeze back up. Please stay on the trails, and ride with extra caution. Lena Snowdrifters will close all trails Wed Morning 3/13/19. Please stay off until you see a post that they are open. Trying to save the base with the rain and warm temps forcasted. Good afternoon, the Chase trails will be closing Wednesday March 13th, 6AM. Oconto Falls Tubing Hill - CLOSED this weekend 3/16 & 3/17. It's -9 degrees in beautiful downtown Townsend this morning. The trails are in excellent riding condition. This mornings riders will find the trails hard and and fast!! Get out early and enjoy. Watch for deer on the trails. Chute Pond trails are open, being groomed, and are in very good condition. Grooming will be ongoing- so please watch for them on the trail any time of day or night- and always yield the right of way to the groomers. Stay to the right, and enjoy your ride! B & B Joyriders trails are in excellent condition again this week. The groomers will be out on the trails throughout the week. So be careful for the groomers on the trails. Also watch out for deer on the trails, they are using the trails to move around. Gillett trails are in great shape after last weekends winds. We groomed hard and go through all the drifts, some areas are a little narrower now, but with regular grooming they should be back to their normal width soon. There is lots of snow on the trails now get out and enjoy. Groomers were out and all trails were groomed multiple times this last week and with 3-5 inches of freshj powder, they should be awesome this weekend. Obviously with a lot of traffic, they will get a little rough. Thanks to our groomer drivers for all their time! Ride safe and enjoy them while they last. Trails are open and in good to excellent condition. Grooming regularly. Chase Sno Chasers Trails - Trails are open and in very good to excellent condition. Trails are in great condition. The ski trails were groomed Saturday evening after a very good day for skiing. The track got soft and sticky where the sun was shining on it Saturday afternoon. That likely won't be a problem on Sunday with the cooler temps. With the plentiful sunshine the skiing should be very comfortable and perhaps a little fast. Oconto Falls Tubing Hill - We will be open this weekend on SATURDAY (3/9) ONLY 1-4pm. It's going to start raining/snowing about 6:00pm on Saturday and go through Sunday morning, bringing us 5.7" with 35mph gusts of wind. It's 4 degrees in beautiful downtown Townsend this morning. The trails are in very good riding condition. We received about 3.5 inches of fluffy snow Tuesday night, so the trails are fluffy and slippery until it adheres to the established base. This should make riding in the woods beautiful with all the fresh fallen snow. Groomers will be out tonight and all weekend to make the trails the best possible. The trails have been groomed and are in great condition. We got 3 to 4 inches of powder. There is 1 to 2 inches expected for late in the week. Ride safe. Chute Pond Snowmobile Trails (Suring/Mountain) - Chute Pond trails are open, being groomed, and are in very good condition. Grooming will be ongoing- so please watch for them on the trail any time of day or night- and always yield the right of way to the groomers. Stay to the right, and enjoy your ride! B&B Joyriders trails are in excellent condition again this week. The groomers will be out on the trails throughout the week. So be careful for the groomers on the trails. Also watch out for deer on the trails, they are using the trails to move around. If you ride to Suring, the old trail is closed through the golf course, but the trail does go around the golf course by using the side of the road, it will bring you back into town. Groomers were out and all trails were groomed multiple times this last week and with 3-5 inches of fresh powder, they should be awesome this weekend. Obviously with a lot of traffic, they will get a little rough. Thanks to our groomer drivers for all their time! Ride safe and enjoy them while they last. Lena Snowdrifters- Trails are open and in good to excellent condition. Grooming regularly. Complete Trail groomed with the quad. Trail is a little soft will firm up tonight and make for great skiing Friday and the weekend. There is one bad downhill on the blue trail north of the golf course, just past a snowmobile crossing. The ski trails were groomed last night (2/21) and are in really great condition. Our groomer left for the Birkebeiner this morning so there will not be any grooming over the weekend. The skiing should be very good until the weather decides to turn on us with freezing rain later Saturday. There may be a chance the rain will miss us and we get all snow, but it would likely be wet. That could mess the skiing up until regrooming, but keep an eye on what the weather brings. Oconto Falls Tubing Hill - Opening Saturday, March 2 from 1:00pm-4:00pm, Closed on Sunday, March 3rd. It's 28 degrees in beautiful downtown Townsend this morning. The trails are in excellent riding condition. We only received 3? so far from the storm, but they were right about the strong winds. It is really blowing around here right now. Our groomers were out last night and will be out again tonight to smooth things out to freeze up hard with the cold weather settling back into the area. We were out grooming Sunday night and will continue today. The high winds have put several branches on the trail slowing the grooming progress. We will continue today. If you venture out today be careful because there is dangerous wind chills. Bagley and Brazeau Joyriders Snowmobile Trails - Trails are in excellent condition. The groomers will be out all week. So be careful for the groomers on the trails. If you ride to Suring, the old trail is closed through the golf course, but the trail does go around the golf course by using the side of the road, it will bring you back into town. Gillett trails are all open and in excellent condition. We are experiencing some of the best trail conditions we have seen in years. We are out grooming quite offer the best riding conditions possible. Our groomer drivers are all volunteers and operate when they have time so they could be out at any time. Be alert, drive safely! Along with that please obey trail signs we put them up for a reason. Oconto Falls Sno-Jokers - Trails are in good condition. Machickanee Ski Trails - The ski trails were groomed last night (2/21) and are in really great condition. Dave left for the Birkebeiner this morning so there will not be any grooming over the weekend. The skiing should be very good until the weather decides to turn on us with freezing rain later Saturday. There may be a chance the rain will miss us and we get all snow, but it would likely be wet. That could mess the skiing up until regrooming, but keep an eye on what the weather brings. Oconto Falls Tubing Hill - Update will be made later this week. It's 17 degrees in beautiful downtown Townsend this morning. The trails are in excellent riding condition. The Weather channel has us getting another 3?-5? today and into tonight. Another 1?-3? Friday night and another 8?-12? Saturday night. The groomers were out Thursday night and trail condition's are excellent. We have plenty of snow to work with to bring you awesome riding. We are expecting heavy traffic this weekend. Ride safe. Oconto Falls Tubing Hill - As of right now closed on Saturday, February 23rd and open on Sunday, February 24th from 1pm-4pm. Red Arrow Snowmobile Trails (Townsend) - It's 19 degrees in beautiful downtown Townsend this morning. We have received 5? of fresh snow so far, with another 3?-5? possible before the storm is over. The trails are in excellent riding condition. The groomers will most certainly be out working their magic on the trails throughout the rest of the week. Paul Bunyan (Lakewood) - The groomers are having trouble getting through over a foot of snow that fell. This will take a while to get the trails in shape. Watch for the groomers during the day till we can get the entire system done. Trails are in excellent riding condition. Chute Pond Snowmobile Trails (Suring/Mountain) - Chute Pond trails are open, being groomed, and are in very good condition. There may be some low hanging branches from the recent heavy snow (10-14" in the past several days), so please use extra caution. Grooming will be ongoing- so please watch for them on the trail any time of day or night- and always yield the right of way to the groomers. Stay to the right, and enjoy your ride! 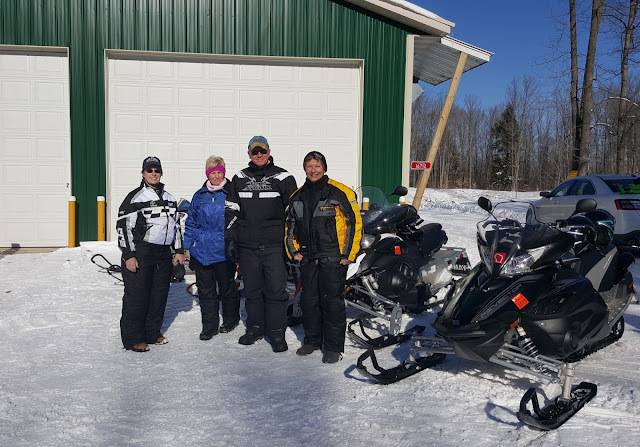 Bagley and Brazeau Joyriders Snowmobile Trails - B &B Joyriders trails received 16"of new snow this week and it's only Tuesday. The groomers went out Monday and will be out all day Wednesday and Wednesday night. They are also going out all day Friday and Friday night. So be careful for the groomers which will be out there. The trails are in excellent condition. Some of the open fields are drifting so watch for drifting snow, ride safe. If you ride to Suring, the old trail is closed through the golf course, but the trail does go around it and back into town. Gillett - Trails are open and groomed and in excellent condition. Oconto Falls Sno-Jokers - Groomer will be out after almost 12" of fresh snow. It will all be groomed by the weekend. Please be cautious of drifting in the open fields. Now is the time to ride! Lakewood Cross Country Ski Trails - With roughly 12 inches of new snow trails will be groomed and in great condition. Machickanee Ski Trails - Trails are open and in good condition. Oconto Falls Tubing Hill - Hill will be open on Saturday, February 16th and Sunday, February 17th from 1:00pm-4:00pm. Bring your own tube. Only 45 tubes available to share. Red Arrow Snowmobile Trails (Townsend) - It's 14 degrees in beautiful downtown Townsend this morning. We received 6 1/2? of fresh snow yesterday, and if my Weather Channel App is accurate, we could receive 5?-8? more Thursday. This should turn the area into snowmobilers heaven. The groomers will most certainly be out working their magic on the trails tonight and throughout the rest of the week. Paul Bunyan (Lakewood) - It's 5:30 am Friday and the area received 5 to 6 inches of fresh snow. It started out as rain so this was a better packing snow to groom. The groomers got in early this morning and there is another shift going out to open the trails that are blocked by plowing operations on the town and county roads. It's going to be windy so expect drifting snow in the open areas. Ride safe and watch for the groomers. Chute Pond Snowmobile Trails (Mountain) - Chute Pond trails are open, being groomed, and are in very good condition. There may be some low hanging branches from the recent heavy snow (8-12" in the past week), so please use extra caution. Grooming will be ongoing- so please watch for them on the trail anytime of day or night- and always yield the right of way to the groomers. Stay to the right, and enjoy your ride! Bagley and Brazeau Joyriders Snowmobile Trails - B &B Joyriders trails received 5" of new snow, Tuesday. The groomers have been out all day Wednesday and Wednesday night. They will be back out Friday after the next snow fall, 3" to 6" that maybe on the way. The trails are in good to excellent condition. Some of the open fields on the south end of the trail system are a little light of snow. If you ride to Suring, the old trail is closed through the golf course, but the trail does go around it and back into town. Gillett - Trails are open and groomed earlier today and in good shape. Be aware there is ice under the snow be cautious. Oconto Falls Sno-Jokers - Oconto Falls trails will be open today 2/7 at noon. We will be grooming today and tomorrow as our volunteer groomer drivers schedules allow. Lena Snowdrifters- Trails are open. Chase Sno Chasers Trails - Trails are open. Machickanee Ski Trails - Waiting on new report after fresh snow fall. Oconto Falls Tubing Hill - Hill will be opening Saturday, February 9th and Sunday, February 10th from 1pm-4pm. Reminder this is a tube only hill. A new report will be posted soon - Oconto County received roughly 5-7 inches of snow throughout the entire County. Temperature on Saturday and Sunday in Oconto County are said to be in the 30's and 40's!! Red Arrow Snowmobile Trails (Townsend) - It's 14 degrees in beautiful downtown Townsend this morning. Quite a change from the past mornings. A heat wave on Sunday sounds terrible, can't we just settle into the 20's? The trails are fantastic, smooth, hard and fast. BEST TRAILS IN A VERY LONG TIME!!! Right now the trails east of Hwy 32 are in VERY GOOD CONDITION. The Nicolet State Trail ( The Grade ) I would say that it is in VERY GOOD CONDITION. The trails west of town toward Hwy 64& T are in VERY GOOD CONDITION on the level trails. In the hills they are in VERY GOOD CONDITION AS WELL. Paul Bunyan (Lakewood) - The less traveled secondary trails were groomed Friday afternoon and the balance of the Paul Bunyan Trails were groomed during the night. They are very good to excellent. We expect lot of traffic today into the evening. Our groomers will be out tonight before the predicated freezing rain that is forecasted. Ride safe!! Chute Pond Snowmobile Trails (Mountain) - Chute Pond trails are open, freshly groomed, and in good to very good condition. Grooming will continue, so please watch for them on the trail anytime of day or night- and always yield the right of way to the groomers. Stay to the right, and enjoy your ride! Bagley and Brazeau Joyriders Snowmobile Trails - B &B Joyriders trails received 5 to 6" of new snow this week; the groomers have been out all day Tuesday and will be back out Friday. The trails are in good to very good condition but remember the winds will be moving the snow around mainly in the open fields, so watch for drifting snow. If you ride to Suring, the old trail is closed through the golf course, but the trail does go around it and back into town. Gillett - Gillett trails are all open and in good condition. Oconto Falls Sno-Jokers - Oconto Falls Snowmobile Trails are closed starting Monday, February 4th. Lena Snowdrifters- Lena Snowdrifters trail system is open! Panning of trails will continue, expect early season conditions. Please stay on marked trails! 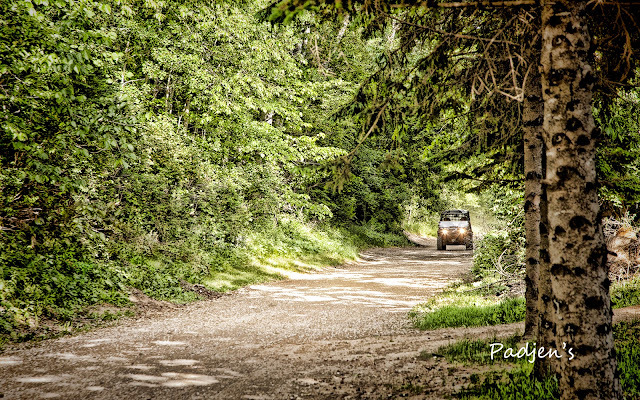 Leaving the trail is tresspassing and can be dangerous as ruts, rocks and other hazards could be hidden. Ride safe, sober and enjoy! Chase Sno Chasers Trails - Closed starting Sunday, February 3rd at 6:00am. Will firm up tonight and be excellent on Saturday. Machickanee Ski Trails - As of today, we finally got enough snow for good grooming. Hopefully, it will be warm enough to allow us to set tracks on Friday. Worst case, it should be done by Saturday morning. As of now it looks like the temps on Saturday should allow for great conditions for the Candlelight Ski. This will be the first time in a long time that we can say that. Oconto Falls Tubing Hill - Open Saturday, February 2nd and Sunday February 3rd from 1pm till 4pm. Red Arrow Snowmobile Trails (Townsend) - It's -1 degrees in beautiful downtown Townsend this morning. The trails are really nice, smooth, hard and fast. The Storm is here and has dropped about 2?-3? of fluffy snow so far. It is still snowing, we will see what we end up with? Also some serious cold coming in the next week. A high of -10?F on Wednesday????? REALLY? Can you say Polar Vortex? So please dress for the conditions to avoid frostbite!! Right now the trails east of Hwy 32 are in VERY GOOD CONDITION. The Nicolet State Trail ( The Grade ) is icy in spots so be careful! I would say that it is in VERY GOOD CONDITION. The trails west of town toward Hwy 64& T are in VERY GOOD CONDITION on the level trails. In the hills they are in GOOD CONDITION. We still need more snow there for covering the rocks completely. Paul Bunyan (Lakewood) - It's still 2 below at noon today. we are expecting snow tonight so we will be out grooming today before the snow comes . We had several groups riding that said our trails were awesome. The turnout was very good. I would like to thank all the volunteers that helped . Chute Pond Snowmobile Trails (Mountain) - Chute Pond trails are open and in fair to very good condition. It is snowing here at Chute Pond on Monday morning, Jan 28th, with 2" on the ground so far. Be aware of some icy areas, especially on turns. The groomers will be out again after today's snow event, so please watch for them on the trail anytime of day or night- and always yield the right of way to the groomers. Stay to the right, and enjoy your ride! 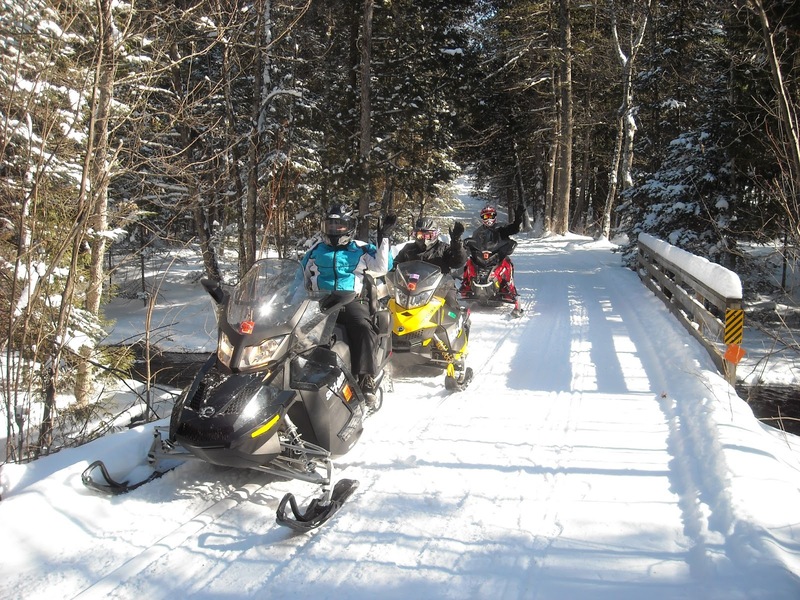 Bagley and Brazeau Joyriders Snowmobile Trails - The B & B Joyriders trails are now all open. We received 5.5 " of snow the last 2 days The groomers were out all day Wednesday and will be out all day Thursday. The trails that have been groomed last week are in good condition and the trails that have just been groomed are fair to good condition. Remember the trails just opened this year so it's like early season conditions on 2/3 of the trail. There also is ice under the snow in spots so ride safe. Gillett - Grooming was done today & trails are panned. Trails will open Saturday- 6:00 a.m. Due to early season conditions, RAILROAD GRADE ONLY will be open from Shawano Line Rd to Suring. Fields still have open spots and are to thin. Accumulating snow is expected Monday !! CAUTION RIDERS...There are logging projects between County H & Suring. Fourtowns Road intersection & Rodhloff Lane intersection. Possible delays if trucks are loading!! Thank you for your patience! Hope everyone has a fun & safe riding season. Lakewood Cross Country Ski Trails - We received 1" to 2" of snow yesterday. It is snowing this morning and it is predicted we will get another 1" or so. We are planning to groom on Thursday, January 24th. Machickanee Ski Trails - Well, we finally got some snow, but who was counting on these bitter cold conditions!! Dave looked at grooming the trails Thursday evening. There is probably enough snow, but just barely. He decided that there was just too much wind to make it worthwhile. The tracks would have blown shut just about as fast as he could have set them. Perhaps he can get at them before the weekend. If not, you should be able to "ski-in" a track, especially on the Blackberry Ramble and Corral Berry Trails. The Brehmer Creek and Timberwolf Trails would be very questionable for skiing without a track because of the bigger hills and no "soft landings" if you fall. Oconto Falls Tubing Hill - It's possible the tubing hill will open this weekend, February 2nd and 3rd, if temperature stays as predicted for Saturday/Sunday. Red Arrow Snowmobile Trails (Townsend) - It's 16 degrees in beautiful downtown Townsend this snowy morning. Right now the trails east of Hwy 32 are in good to very good condition. The Nicolet State Trail ( The Grade ) is very icy in spots so be careful! I would say that it is in good to very good condition. The trails west of town toward Hwy 64& T are in good to very good condition on the level trails. In the hills it is still FAIR TO POOR. We still need more snow there for covering the rocks. Paul Bunyan (Lakewood) - All three groomers were out last night and conditions are great. We wanted to have them totally flat before the snow starts today. Cross your fingers that it happens. Will update snow totals Wednesday. Chute Pond Snowmobile Trails (Mountain) - Chute Pond trails are open. We got a couple inches of fresh snow, and the groomers are out. There may be some dips and ruts on hilly wooded trails that have not filled in yet. There may also be some icy areas. Riding is not advised on the NST south of Hwy 32 to Suring and also the route through Suring to Golf Course Rd due to low snow cover. The pipeline trail may not be groomed until the low spots freeze up more- use extra caution if you ride in that area. Watch for groomers on the trail anytime of day or night, and always yield the right of way to them. Enjoy your ride! Machickanee Ski Trails - 1/16/19 Continued poor winter/snow conditions so far. Some attempt has been made to pack the trails. Varying temperatures and mixtures of snow and rain have made tracking all but impossible. There has been some limited skiing on the packed snow. Maybe some snow Saturday, but likely too little too late to help out with the Candlelight Ski scheduled for Saturday. Oconto Falls Tubing Hill - CLOSED. It's currently snowing in Oconto County! As the snow falls for the next day or two, please watch for groomers on the trails day/night. Red Arrow Snowmobile Trails (Townsend) - It's -12 degrees in beautiful downtown Townsend this morning. The groomers were out last night and reports are that they groomed out great once again, but need snow! The trails east of Hwy 32 are in GOOD TO VERY GOOD CONDITION. The Nicolet State Trail ( The Grade ) is very icy in spots so be careful! I would say that it is in GOOD TO VERY CONDITION. The trails west of town toward Hwy 64& T are in GOOD TO VERY GOOD CONDITION on the level trails. In the hills it is still FAIR TO POOR. We still need more snow there for covering the rocks. The trails are starting to show wear with 2-6 inches of new snow in the forecast for Tuesday, maybe things will change for the better as long as there is material to work with, we will continue to groom. Pray for snow!! Paul Bunyan (Lakewood) - Paul Bunyan Trails were groomed last night and they turned out great. There were some areas that were a little tore up but we have such a great base we were able to put them back in shape for the balance of the weekend. Trail Boss Bob Prasser rides the trails daily checking them. We will continue grooming to bring the best trails in the area to ride on. Hopefully the forecasted snow for Monday into Tuesday will give us 4 plus inches as predicted. Ride safe and watch for groomers at night. Chute Pond Snowmobile Trails (Mountain) - Chute Pond trails are open. Trails are panned and in early season condition, meaning to watch for dips and ruts that will need more snow to fill in. There may also be some icy areas. Riding is not advised on the NST south of Hwy 32 to Suring and also the route through Suring to Golf Course Rd due to low snow cover. The pipeline trail may not be groomed until the low spots freeze up more- use extra caution if you ride in that area. Watch for groomers on the trail anytime of day or night, and always yield the right of way to them. Enjoy your ride! 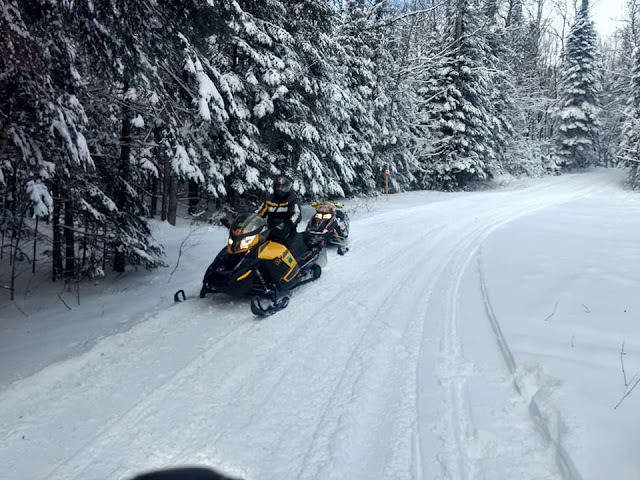 Bagley and Brazeau Joyriders Snowmobile Trails - We panned the trails that are open today. Sections of the BB Joyriders trails are open. The trails have improved a little so we groomed and panned the trails that are open. Trails south of Hwy Z are closed and east of Parkway Rd, up to Hwy 64 are closed. Intersections 408, 425 are closed to the south. This means Kelly Lake and Lee Lake areas are closed. Trails are closed to Suring and Klondike. There is about 1" of snow on the lakes including White Potato Lake now. Trails that are open surround White Potato Lake and to the north. Trails do have some icy areas. Early season riding conditions, the trails are fair at this time. Remember, there is very little snow on the lakes. The snow is very hard on the top surface of the trails, if the weather changes, they may improve. We will need snow before we will be opening the rest of the trail system. Be very careful riding the trails that are open. Lakewood Cross Country Ski Trails - Grooming will take place today Thursday, January 17th. Machickanee Ski Trails - Continued poor winter/snow conditions so far. Some attempt has been made to pack the trails. Varying temperatures and mixtures of snow and rain have made tracking all but impossible. There has been some limited skiing on the packed snow. Maybe some snow Saturday, but likely too little too late to help out with the Candlelight Ski scheduled for Saturday. Red Arrow Snowmobile Trails (Townsend) - It's 16 degrees in beautiful downtown Townsend this morning, and the guys just got in from grooming at about 4:00 AM this morning. We had a lot of riders on our lovely trails yesterday, I hope you all had a great and safe day of riding?'? !The trails east of Hwy 32 are in GOOD TO VERY GOOD CONDITION. The Nicolet State Trail ( The Grade ) is very icy in spots so be careful! I would say that it is in GOOD TO VERY CONDITION. The trails west of town toward Hwy 64& T are in GOOD TO VERY GOOD CONDITION on the level trails. In the hills it is still FAIR TO POOR. We still need more snow there for covering the rocks. The GROOMERS WILL BE OUT TONIGHT AND THROUGHOUT THE WEEK, as long as there is material to work with. Pray for snow!! 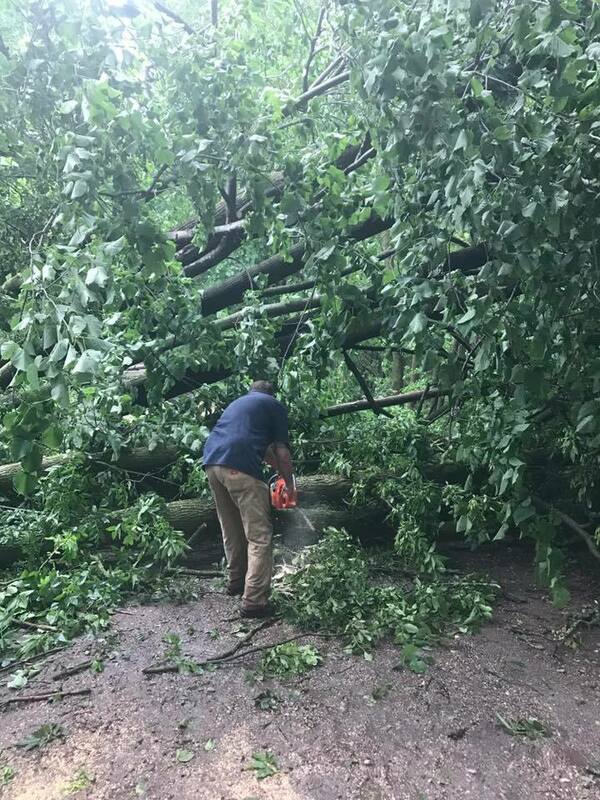 Paul Bunyan (Lakewood) - All three tuckers were out again Saturday night and will be out tonight getting them smooth for Monday. We are going to have a 2 day warm up and as soon as it cools down we will groom them because next weekend the temperature is taking a dive. It would help if we received a few inches of snow. There was a huge amount of riders on Saturday and I received several calls complementing the great job our dedicated grooming team has done. Trail Boss Bob Prosser and assistant Bob Goble have done a great job as well as our drivers. Pray for snow and ride safe. Chute Pond Snowmobile Trails (Mountain) - Chute Pond trails are open. Trails are panned and in early season condition, meaning to watch for dips and ruts that will need more snow to fill in. There may also be some icy areas. Riding is not advised on the NST south of Hwy 32 to Suring and also the route through Suring to Golf Course Rd due to low snow cover. The pipeline trail will not be groomed until the low spots freeze up more- use extra caution if you ride in that area. Thank you to our groomer team for their hard work getting our trails ready to open. Enjoy your ride! 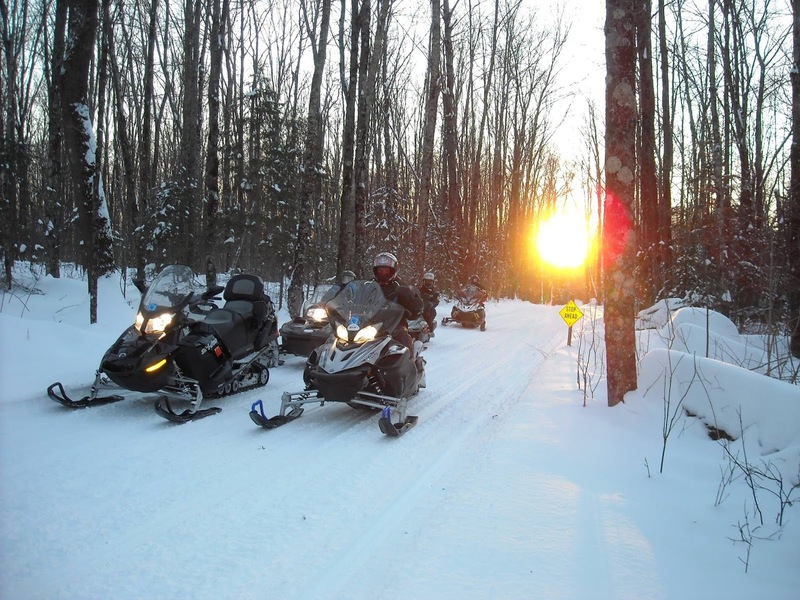 Bagley and Brazeau Joyriders Snowmobile Trails - Sections of the BB Joyriders trails are open. 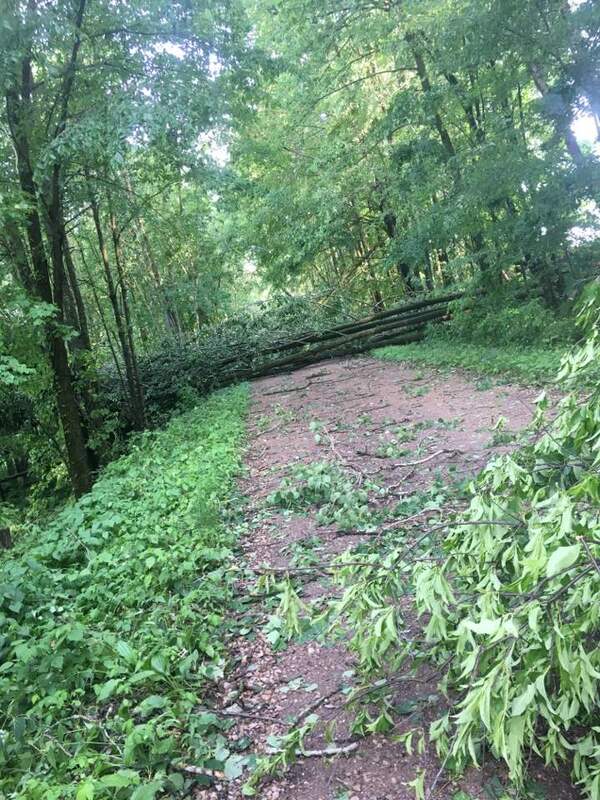 Trails south of Hwy Z are closed and east of Parkway Rd, up to Hwy 64 are closed. Intersections 408, 425 are closed to the south. This means Kelly Lake and Lee Lake areas are closed. Trails are closed to Suring and Klondike. There is no snow on any of the lakes including White Potato Lake. They are all bare ice. Trails that are open surround White Potato Lake and to the north. All these trails have not been groomed and have many icy areas. Early season riding conditions are poor at this time. Remember, there is no snow on any of the lakes. The snow is very hard on the top surface of the trails, if the weather changes, they may improve. Red Arrow Snowmobile-ATV Club - It's 36 degrees in beautiful downtown Townsend tonight. We received about 5.5? of heavy wet snow overnight. After the rain on and off most of the day we have about 3.5? left. As I said it is very heavy and wet, but should pan out well to add to our base, which surprisingly has held up well. It is to wet to groom until it cool down quite a bit. Right now the snow will not process through the groomers drag. It needs to cool down quite a bit not just air temperature but the snow needs to cool down too. We plan to resume grooming operations Wednesday evening, it is supposed to be nice and cold by then. This should provide hopefully some darn nice trails for the weekend. Paul Bunyan Snowmobile Trails - The temperatures dropped low enough by 11 am today to send the groomers out. All three Tuckers are panning the trails and the balance will be finished on Wednesday. There is a lot of ice on the grade and we will try to pull in some snow for lube. The trails in the woods are very good. We expect heavy traffic this weekend since Iron Snow Shoe to our east will be open as well as Forest county. Chute Pond Snowmobile Trails - Chute Pond trails will open at 8:00 am Thursday, January 10, 2019. Trails are panned and are in early season condition and extra caution is advised until we get more snow to fill in the dips and ruts in some areas. Watch for icy areas, especially in the low spots along the trails. 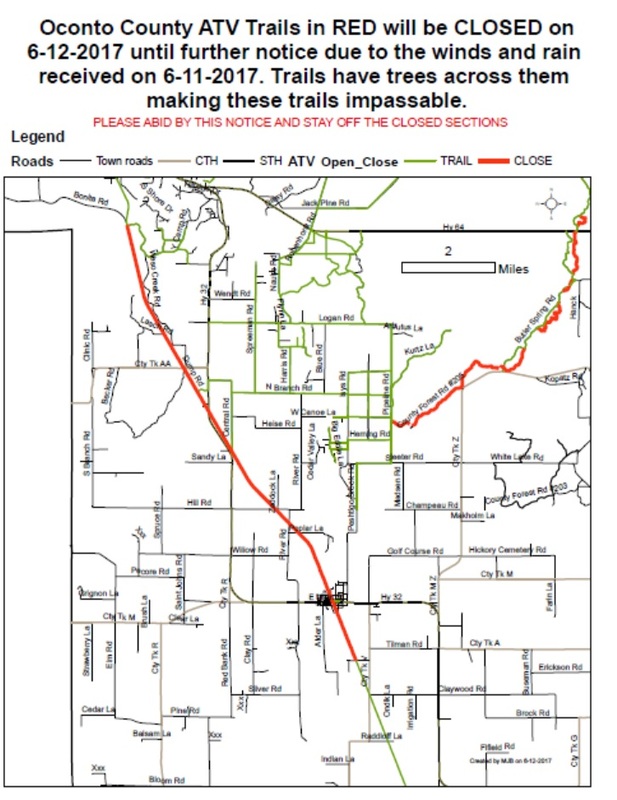 Riding is not advised on the NST (RR grade) south of Hwy 32 to Suring due to low snow cover, the trail through Suring to Golf Course Rd also has low snow cover, and the pipeline trail has not been groomed yet because of low wet areas. Sections of the BB Joyriders trails are open. Trails south of Hwy Z are closed and east of Parkway Rd, up to Hwy 64 are closed. Intersections 408, 425 are closed to the south. This means Kelly Lake and Lee Lake areas are closed. Trails are closed to Suring and Klondike. There is no snow on any of the lakes including White Potato Lake. They are all bare ice. We will need snow before we will be opening the rest of the trail system. Be very careful riding the trails that are open. Lakewood Cross Country Ski - The trail surface was extremely hard frozen snow. The groomers went out today and groomed the entire trail. The plan is to go out tomorrow and continue to level the skate deck and set tracks. For more information call the ski hotline at 715-622-1754. 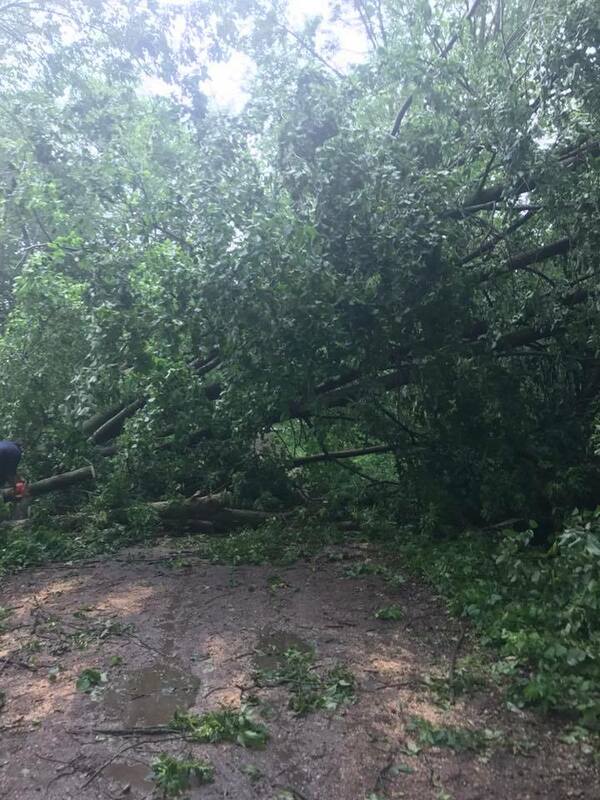 Paul Bunyan Snowmobile Trails - The Lakewood area received 5 to 6 inches of wet snow followed by lot of rain. As soon as the temperature drops below freezing we will be out grooming. At this time it looks like Wednesday morning. The cold weather should freeze the trails up for some great riding. If you go out before we groom watch for down limbs and trees due to the wet snow. Ride safe. Chute Pond Snowmobile Trails - We got 3-4" of wet snow last night, followed by sleet and rain. Our groomer team will be out as soon as the rain stops to pack/groom the trails. All side trails remain CLOSED until further notice. ?The Nicolet State Rec Trail (RR grade) from Hwy 32 in Suring north to Paul Bunyan trails near Tar Dam Rd is open and in early season condition. All side trails will remain CLOSED until we get more snow. Gates on the side trails will remain closed- do not ride on closed trails. Our neighboring clubs Red Arrow in Townsend and Paul Bunyan in Lakewood have opened their trails, and now you can travel north to their trails on the NSRT. Partially Open - see full details below. The Paul Bunyan Riders (Lakewood) as well as The Red Arrow Snowmobile Club (Townsend) will open the trails at 8:00 am today, December 29th. We have a good base but there is ice and large ruts as well as many rocks sticking out. You are advised to ride with extreme caution. There will be little or no lube for your slides. Ride safe and pray for snow. Red Arrow Townsend - It's 25 degrees In beautiful downtown Townsend this morning, Our trails on the EAST side of highway 32 are in FAIR to GOOD riding conditions, considering we could use some more snow, not bad. The trails west of town toward highways 64& T are in POOR to FAIR riding condition at best, due to all the hills and rocks that need more snow badly. There is fun to be had in any of the trails you may select, just be careful and keep a look out for truck ruts and washouts. Remember there is a lot of ice out there as well right now. These are early season riding conditions?? The groomers probably won't be out again until we get more snow. There just isn't any material to work with at this time!! Chute Pond is opening the Nicolet State Rec Trail ONLY tomorrow (Tuesday, January 1st, 2019) at 8:00am. All side trails remain gated and closed at this time. The NSRT will open from Hwy 32 in Suring north to Paul Bunyan trails near Tar Dam Rd, and will allow riders to access the Paul Bunyan and Red Arrow trails from the south. Lakewood Cross Country Ski - The golf course is groomed, firm,smooth and fast. It is thin in spots. Part of the green trail is groomed but uneven and bumpy. You can crust ski in most places and bushwhack pretty near anywhere. There was about 1/2" of snow yesterday which helps. If you don't have to drive far it is worth trying. Take care and avoid steep downhills. Oconto Falls Tubing Hill - The Tubing Hill will NOT be open this weekend (January 5 and 6). Not enough snow. The Paul Bunyan Riders as well as The Red Arrow Snowmobile Club will open the trails at 8am today, December 29th. We have a good base but there is ice and large ruts as well as many rocks sticking out. You are advised to ride with extreme caution. There will be little or no lube for your slides. Ride safe and pray for snow. Red Arrow and Paul Bunyan Trails will open this morning at 8:00AM. We groomed just shy of 13 hours yesterday to make the trails as good as can be expected. But don't expect to much because they are POOR AT BEST, with a lot of truck ruts in many areas and lot's of ice on the grade at select spots and on the trails as well. All Oconto County Snowmobile Trails are CLOSED. An update will be posted once we get snow. The Lakewood Cross Country Ski Trails are officially open! All trails have been rolled and combed. No tracks set. Please use caution as early ski conditions exist. For complete trail report please call 715-622-1754. Have a safe and fun ski season! Oconto County ATV Trail System is CLOSED for the season. The trails we reopen in Spring of 2019. 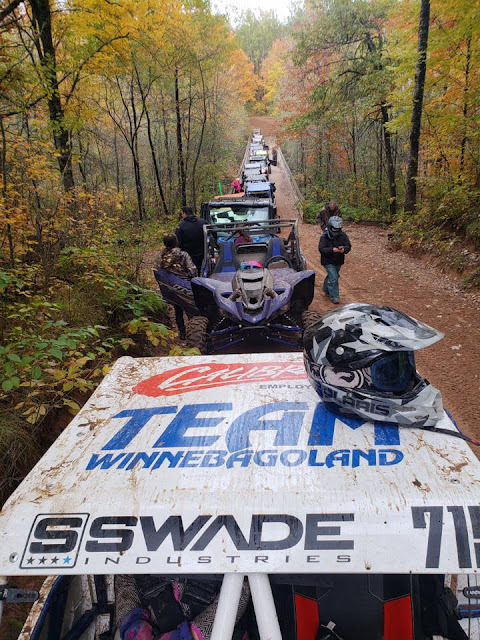 OCONTO COUNTY ATV TRAILS CLOSE SUNDAY, NOVEMBER 4, 2018. Please be advised that the Oconto County ATV trails will close effective Sunday, November 4, 2018 at 11:59 PM. This closure includes the Nicolet State Trail System. ATV trails will re-open when conditions warrant in spring of 2019. Another press release will be placed in the paper when trails re-open. As of right now there are NO trail closures due to the rain. It will be a beautiful ride this weekend as Northern Oconto County is at peak for Fall colors. Reminder that ATV/UTV trails close for the season on Sunday, November 4, 2018. Make sure to get your riding in during these last couple of weeks. The Nicolet State Recreation Trail will be closed from September 25, 2018 until September 28, 2018 from County Road H to Four Towns Road. The Nicolet State Recreation Trail will be closed from September 13, 2018 until September 14, 2018 from County Road H to Four Towns Road. The Spice Lake Bridge decks are being replaced. The use of all-terrain vehicle trails remains close. Trails will open as posted or published by the Forest, Parks and Recreation/Land Information Systems Sub-Committee. No person shall drive an all-terrain vehicle on any lands, highway or trail under supervision, management or control of the Forest, Parks, and Recreation/Land Information Systems Sub-Committee during these closed periods. For further information, please contact the Forestry and Parks Department at 920-834-6995. 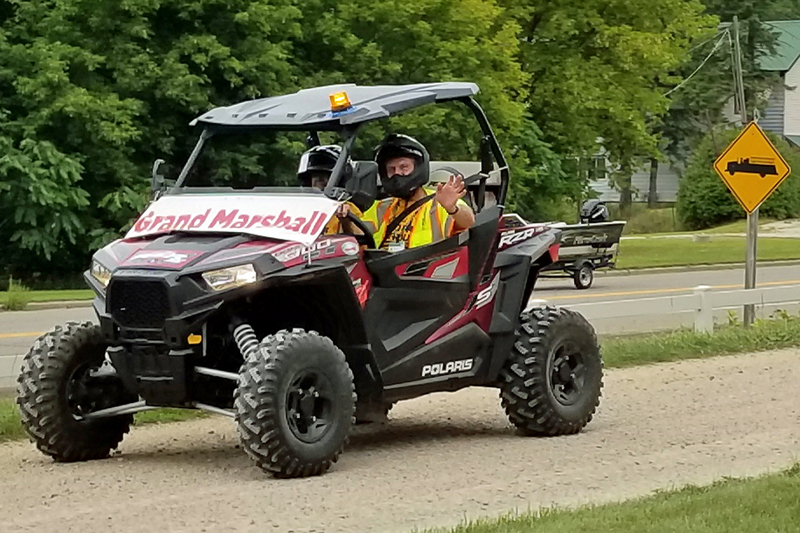 The Oconto County ATV trails WILL NOT open the last Saturday in April (4-28-2018) as ordinance allows. The use of all-terrain vehicle trails will be open, weather permitting, as posted or published by the Forest, Parks, Recreation/Land Information Systems Sub-Committee. No person shall drive an all-terrain vehicle on any lands, highway or trail under supervision, management or control of the Forest, Parks, Recreation/Land Information Systems Sub-Committee during these closed periods. ALL OCONTO COUNTY SNOWMOBILE TRAILS WILL CLOSE 11:59pm Monday, March 12, 2018. Snowmobile Trails - Click here to view live camera from Jen's Firelite Lounge in Lakewood. It's 18 degrees in beautiful downtown Townsend this morning. The groomers were out last night, and will be at least through the weekend. The drivers report that "THE TRAILS ARE IN GOOD TO VERY GOOD RIDING CONDITION ONCE AGAIN". Please beware that those ICY SPOTS still linger beneath the freshly fallen snow! You may find some wet or slushy spots were the water accumulated during the thaw, so again be careful and alert. Hopefully the Nicolet grade will hold up well, as it was completely bare in most areas, stones are already starting to reappear, just so you know! The woods are packed with fun, so go find it!!! FOREST COUNTY TRAILS WILL CLOSE ON MONDAY, SO BE ADVISED!!! They are our immediate neighbors to the north. We have made no decisions as far as our trails go. We will let you know. The trails groomed out very good. The wet snow stuck to the ice in most areas and the bare areas are covered again. The next couple of days should be very good riding. Expect the railroad grade to get thin quick. Sunday and Monday are going to push into the 40 degree range. We will keep grooming as long as we can. Our trails are OPEN and in overall fair to good condition. We got 5-7" of snow in the Chute Pond area, with the southern reaches getting more snow than in the north. Our groomers are out today and tomorrow doing their magic- please watch for them- and yield to them on the trails, any time of day or night. This is bonus time- enjoy your ride! Trails are RE OPENED as of 4 pm today 3/6/18 7 inches as of 2:30 PM of heavy wet fresh snow has accumulated, snow is still falling could be 1 to 2" more. Watch out for water on the trails. We think the trails will be good through the weekend. We will be grooming all day tomorrow with both groomers. The groomers will be focusing on the BB Joyriders trails west of Parkway and all the way north to hwy W. Be careful while riding and watch out for the groomers!! Trails are OPEN, main railroad grade is groomed and in poor to fair condition. Corridor 7 heading south towards Underhill and Pulcifer will remain CLOSED at this time. Watch for a few slush spots. Oconto Falls Sno Jokers - Trails are CLOSED. Lena - Trails are CLOSED. Chase Sno-Chasers - Trails are CLOSED. 4" of new snow yesterday - trails are in good condition. Oconto Falls Tubing Hill - The Oconto Falls Tubing Hill is a FREE recreational activity for all to enjoy! Sponsored by the Oconto Falls Lions Club. Only tubes allowed-no sleds. Saturdays & Sundays from 1:00pm-4:00pm. Hill will open on March 10th & 11th. Snow is currently falling in Oconto County -- a new snow report will be available in the morning after grooming has taken place. It's 30 degrees in beautiful downtown Townsend this morning, with a forecast high of 35? today. A possible snow storm is on the horizon for Monday into Tuesday, with 3?-5? of fun on the way, so I'm thinking your snow dancing is starting to work!!! Keep it up. If we get enough snow the groomers will be out again, with cooler temperatures to follow maybe next weekend can be salvaged!!! Now to the trails, if you can make it to the woods, there is still some nice riding with icy spots and bare mixed in, but try and avoid the Nicolet grade it is mostly bare in a lot of spots. "TRAILS ARE FAIR TO POOR WHEN FACTORING IN THE GRADE". It is 51 degrees and the trails took a big hit today. The 10 day forecast has every day above freezing. This is not good for the remainder of the season. The melting of snow is going to flood the low areas East of Waubee Lake. If you venture out be aware of open water and ice. Our trails are OPEN and in overall poor to fair condition. The sun and warm weather are taking a toll on our trails. Expect some hilltops, curves, and other areas to be bare or gravelly, and some icy/slushy areas. The trails in general are very thin, and open areas exposed to the sun will be melting quickly. Riding early in the day may be better when the temperatures are lower, and wooded and shaded trails will be in better condition than those our in direct sun- especially southern exposures. If the trails survive this week long warm up, some possible snow in the near future may help get them back in shape again. Right now it's a "wait and see" situation. The trail remains in good condition despite above freezing temperatures. Spring conditions and the base is holding up! Saturdays & Sundays from 1:00pm-4:00pm. It's 34 degrees now, and it was near 50 degrees yesterday, it rained last night, and the trails took a beating. The Nicolet looks very sick in a lot of spots. The trails in the woods were ridden by some members yesterday, saying they were darn nice east of town in the woods. They also said from Townsend to Hwy 64 & Cty "T" the trail wasn't bad either, but that was earlier in the day? Don't know how they held up to the late day sunshine or the rain? With warm temperatures forecast for the next 7 days, WOW, I guess we will have to try and wait it out. Grooming operations have ceased until further notice. Wish I had better news, but if you follow my reports, you know I try to tell it like it is. Sorry!! Saturdays & Sundays from 1:00pm-4:00pm. Tubing hill will be CLOSED this weekend. It's 19 degrees this morning in beautiful downtown Townsend, and the trails were freshly groomed last night!!! All is good right now. The forecast is not so good, with temp's in the 40's the next two days. So let's ride while the gettin is good. The drivers tell me that the trails are in "GOOD TO VERY GOOD CONDITION RIGHT NOW". Watch for icy spots throughout though. The weather will dictate further grooming, but we will do our best to keep things smooth for you all. All trails were groomed last night. There is ice under the snow and with the sun and temperature at 41 degrees were not sure how long they will last. The long range forecast is not looking good. If you ride be careful on the corners and hills. Our trails are OPEN and in overall poor to fair condition. The sun and warm weather are taking a toll on our trails. Expect some hilltops, curves, and other areas to be bare or gravelly, and some icy/slushy areas. The trails in general are very thin, and open areas exposed to the sun will be melting quickly. Riding early in the day may be better when the temperatures are lower, and wooded and shaded trails will be in better condition than those our in direct sun- especially southern exposures. If the trails survive this mid-week warm up, possible snow in the near future may help get them back in shape again. It's 27 degrees this morning in beautiful downtown Townsend. Grooming operations have ceased until further notice. There is nothing left but the base. The Nicolet is basically all gravel. In the woods there is riding, but be careful!! The trails took a huge hit yesterday and it will continue today. The railroad grade is down to gravel in many areas. Some of the woods trails are OK but the hills that faced the south are bare and icy. There is small amounts of snow for Sunday into Monday. We need snow and cold weather before grooming can resume. Our trails are OPEN, groomed, and in overall fair condition. Some areas are better than fair, and some a little worse. Expect some hilltops, curves, and other areas may be scraped bare or gravelly, and some icy areas. The trails in general are very thin- they're not beautiful, but they are rideable. The grooming over the past two days has made the trail surface very hard packed, but it's better than the ice crust that was there before. Studded tracks and scratchers may loosen up enough snow to help you out. On a positive note, there are still many miles of trail in good riding condition, but you will encounter some a few poor stretches along the way. Grooming will resume again when it's possible- it will be based on weather conditions, including if we get any fresh snow. The season's not over yet- our trails are rideable, and there's possibly some snow in the next few days. Enjoy your ride! Well, the warm temps took the snow off the fields last week and the freezing rain did not help us this week. There is about 3/8 " of ice on the trails we are keeping the trails open, but the East trail from Lee Lake to Klondike and then north to White Potato lake have no snow on them as of now. The woods trails from Lee Lake north to W is very Ice but rid-able. The trail from 407 to Suring also no snow. If you ride stay in the Woods. We may be getting 2 to 3" of snow Thursday and Friday. This may help to make the trails OK to ride for the weekend. Trails are holding up with the warm up - grooming will take place today. Saturdays & Sundays from 1:00pm-4:00pm. Open on Saturday, February 17th, but CLOSED on Sunday, February 18th. Jones Spring Area Trail - Trails are open. 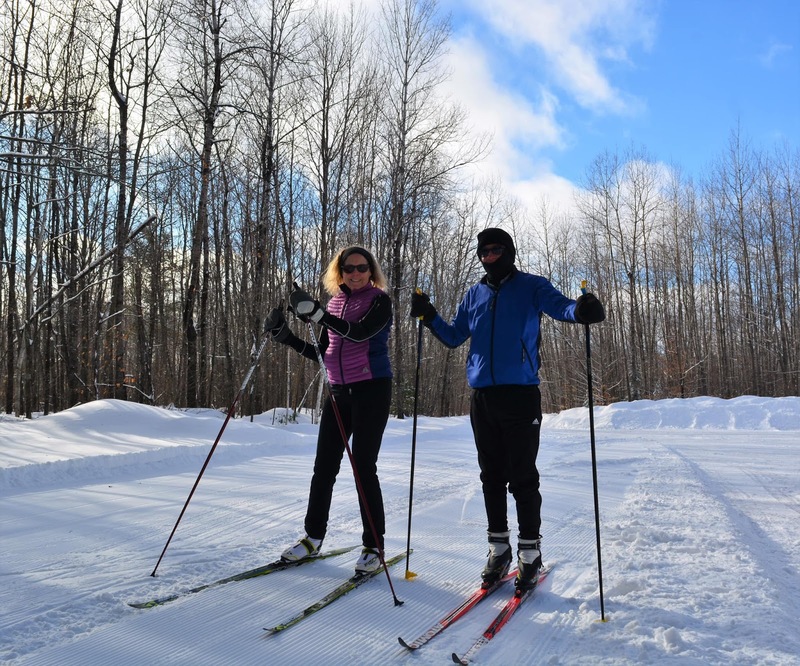 McComb Nordic Ski Trail - Trail is open! Red Arrow Townsend - Trails are OPEN. Some of the trails are not so bad, some not so safe with many rocks and ruts to catch a ski on. I would recommend staying on the trails east of highway 32 for the best riding opportunities. If you choose to venture west of 32 down towards the intersection of 64&T, riders beware of very dangerous areas in the hilly regions. Try to avoid them till we get more Snow. Stay on the groomed roads for now. The Nicolet State Trail isn't to bad now as long as we can keep the base between us and the gravel. The Groomers will not be out until we receive some groomable snow. So don't look for mogul repairs until we get some material to work with. REMEMBER, these are very early riding conditions, proceed with caution. I would rate the trails as "FAIR TO POOR". A young lad got hurt very bad in Forest County last weekend after losing control on conditions similar to ours. Don't let the next one be you! Keep that Snow Dance going!! Paul Bunyan Riders - Trails opening on 1/4/18 at 8:00am. The trail conditions will be poor to fair at best. The section of trail north of Hwy W up to Mountain Lakes Rd near the Big Y (INT 320). Watch for logging on the 18 Corridor trail west of Hwy 32. The wooded trail from INT 455 to INT 472 (Old 64). The pipeline trail from Jack Pine north to INT 447 is rough, but the pipeline trail from INT 447 north to Crooked Lake should be avoided- it is ungroomed and extremely rough. The wooded trail between INT 453 behind the Junction east to Jack Pine Rd. The 18 Corridor trail near Crooked Lake. ?Most trails are panned, but there is not enough snow to fill in all of the ruts yet. Expect some dips, rocks, branches, ruts, and bare spots. Low areas that froze may be icy under a thin layer of snow- and also may have rough broken up ice/dirt in the area. Additional grooming will be done when we get more snow or as needed. Slow down, use extra caution, and enjoy your ride. Always use caution riding on any lake or river. Ice conditions can be unpredictable and can vary greatly from lake to lake- or from one end of a lake to the other. Bagley & Brazeau - The trails are from fair to poor with 5 to 7"of snow. The trails in the woods are the best area to ride. The groomers have been out two days and will be out Friday also. Be sure to watch for the groomers on the trails. The marshes and wet areas need to freeze up more before they can get groomed. We do not know the condition of the Lakes so I would not ride on them at all. Gillett Sno ATV Riders - Trails are OPEN. Trails are in fair to good condition and groomed. Grooming will continue to take place regularly. Corridor 7 heading south out of Gillett to Shawano will be closed until we get more snow. Remember early season conditions exist. Lakewood Cross Country Ski Trails - The trails are rolled and combed. Trails is in early ski season condition with a undulating surface. We need more snow to track the trail. Machickanee Cross Country Ski Trails - Coral Berry Trail was "very skiable" and Blackberry Ramble was "great." No report on Timberwolf Trail but it should be comparable to Coral Berry Trail. You should look over the hills before skiing down. The bigger hills are not good and should be walked down. The smaller hills should be skiable, but look them over first. Red Arrow Townsend - "TRAILS WILL OPEN THIS MORNING 1/4/2018 AT 8:00 AM." It was the recommendation of the Sheriffs Dept. that we open. We have not received any new Snow and the only changes to the trails is more ice. Some of the trails are not so bad, some not so safe with many rocks and ruts to catch a ski on. I would recommend staying on the trails east of highway 32 for the best riding opportunities. If you choose to venture west of 32 down towards the intersection of 64&T, riders beware of very dangerous areas in the hilly regions. Try to avoid them till we get more Snow. Stay on the groomed roads for now. The Nicolet State Trail isn't to bad now as long as we can keep the base between us and the gravel. The Groomers will not be out until we receive some groom able snow. So don't look for mogul repairs until we get some material to work with. Paul Bunyan Riders - Trails opening on 1/4/18 at 8:00am. Chute Pond Snowmobile Club - TRAIL REPORT- UPDATED FRI JAN 5th- Our trails are currently OPEN and in "Early Season Condition". Trails are snow covered, with a 2-3" hard packed base and 1-2" of loose snow on top in most areas. Ride at your own risk, and use extra caution- especially in these areas: The section of trail north of Hwy W up to Mountain Lakes Rd near the Big Y, the entire pipeline trail, the wooded trail between INT 453 behind the Junction east to Jack PIne Rd, and the 18 Corridor trail near Crooked Lake. Most trails are panned, but there is not enough snow to fill in all of the ruts yet. Expect some dips, rocks, branches, ruts, and bare spots. Low areas that froze may be icy under a thin layer of snow- and also may have rough broken up ice/dirt in the area. Additional grooming will be done when we get more snow or as needed. Slow down, use extra caution, and enjoy your ride. Always use caution riding on any lake or river. Ice conditions can be unpredictable and can vary greatly from lake to lake- or from one end of a lake to the other. PLEASE STAY ON THE MARKED TRAILS! Gillett Sno ATV Riders - Trails OPEN on Sunday, December 31st at 8:00 am. Trails are in fair to good condition and groomed. Grooming will continue to take place regularly. Corridor 7 heading south out of Gillett to Shawano will be closed until we get more snow. Remember early season conditions exist. Lakewood Cross Country Ski Trails - All trailed were rolled yesterday. Be safe. It is still early season conditions. Red Arrow Townsend - Trails are CLOSED. 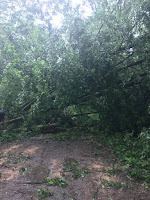 Paul Bunyan Riders - Trails are CLOSED. Chute Pond Snowmobile Club - Trails are CLOSED. Bagley & Brazeau - The trails will open 12/29/2017 Friday 8:00AM the trails are from Fair to poor with 5 to 7"of snow. The wood trails are the best area to ride. The groomers have been out 2 days and will be out Friday so watch for the groomers on the trails. The marshes and wet areas need to freeze up more to get them groomed, remember the groomers are 10,000 lbs and snowmobiles are between 400 and 600 lbs. Can you help us out when you ride in the areas not groomed pack down the outside of the trails not just stay in the middle of it; this will help freeze them up. We do not know the condition of the lakes so I would not ride on them at all. Oconto County Snowmobile Trails remain CLOSED. Red Arrow Trails - "THE TRAILS WILL NOT BE OPEN FOR THE WEEKEND!" The big super storm that was forecast for almost a week yielded 1/4? of snow overnight. Last weeks storm after grooming packed down to about 2 1/2? of base. Not good enough but a start. The warm days this week allowed that to settle down a bit too. The hilly trails down towards 64 and T didn't have enough snow to safely cover the rocks, a very unsafe situation until we get another storm. Paul Bunyan Riders Trails - The big storm predicted for a week was a bust. We started out with a fair base to add to but lost some of it during the week with the warm temps and people riding the trails while they are closed. There is not enough snow to open the trails at this time and the long range shows very low temperatures and very little snow. Chute Pond Snowmobile Trails - Chute Pond trails are closed. The "big snow storm" for this week turned out to be a bust and our trails remain closed. We will keep you posted as to the status of our trail system. Please do not ride on closed trails- this could jeopardize your safety, as well as our agreement with private landowners. 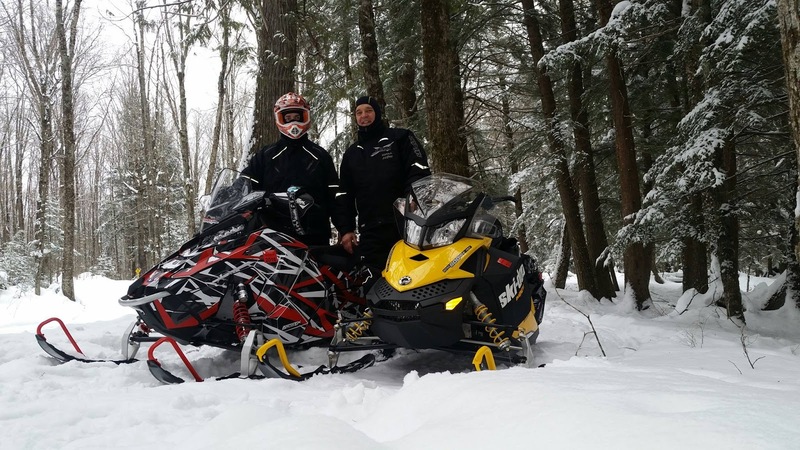 Red Arrow Snowmobile Trails: THE TRAILS WILL NOT BE OPEN FOR THE WEEKEND!" It's 5 degrees this morning in beautiful downtown Townsend. We received around 7?-8? of snow in yesterday's storm. We will be out panning the trails this weekend as will the neighboring Clubs, but that doesn't mean the trails are open just because you see a Groomer. We need to pack the snow down to establish a base and let it freeze down and wait for more snow. Paul Bunyan Riders - The Lakewood area received 6 - 7 inches of powder snow on Wednesday. We are sending our 2 tracked Tuckers out on Friday to pan the trails that are not to wet to go on. We will open the gates at this time but the trails are not open yet. After our operators report the conditions we will decide on a opening date. There will be trees down from the recent winds. Chute Pond Snowmobile Club: Chute Pond trails are CLOSED. We have 5-7" of snow on the ground in the Chute Pond area, but our trails are still CLOSED. Groomers will be going out today and tomorrow to try to pack the snow down. We will keep you posted as to the status of our trail system. Please do not ride on closed trails- this could jeopardize your safety, as well as our agreement with private landowners. The snowmobile season will be here soon! Request your free copy of the Oconto County snowmobile map today, click here! 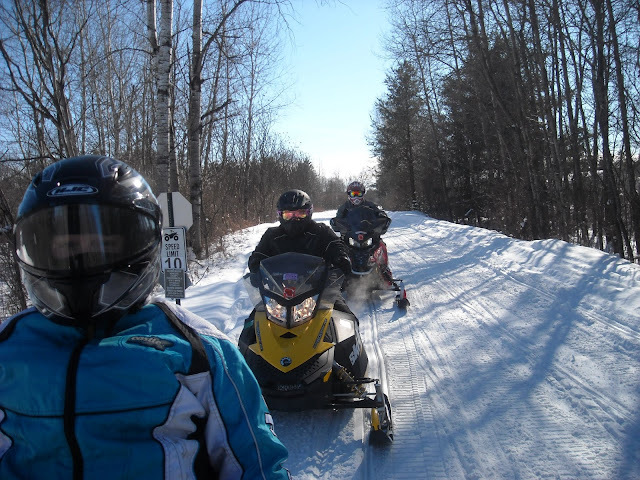 For more information regarding Oconto County's snowmobile trails, click here! The snowmobile season will be here before we know it. Start planning your trip today! 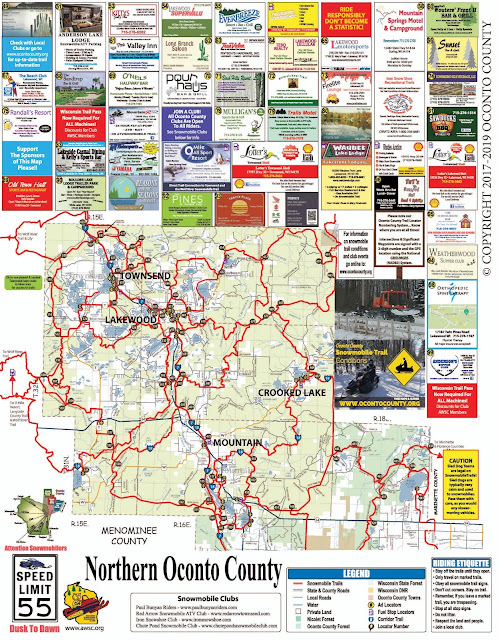 Request a FREE Oconto County snowmobile map, click here! For Oconto County snowmobile trail conditions check here for updates and also on Facebook page and our text program. Text: TOURISM to 36000. 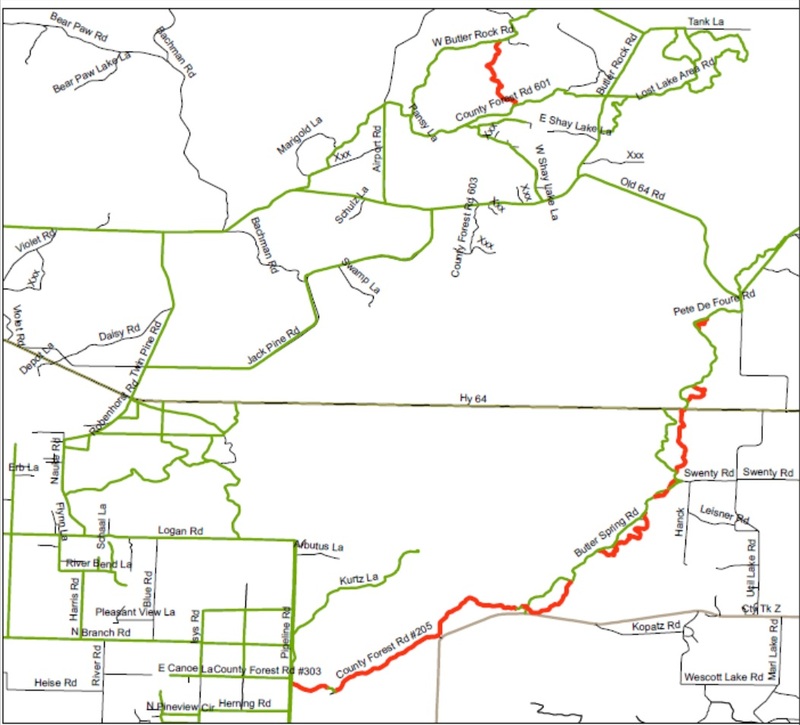 Oconto County ATV Trails in RED remain CLOSED as of 6-8-2017 until further notice due to rains received over the last 2 months. Update: Trail near Tank Lane and Lost Lake Road has been reopened. Gillett Sno ATV Riders trails are officially closed until further notice. Heavy storm damage. 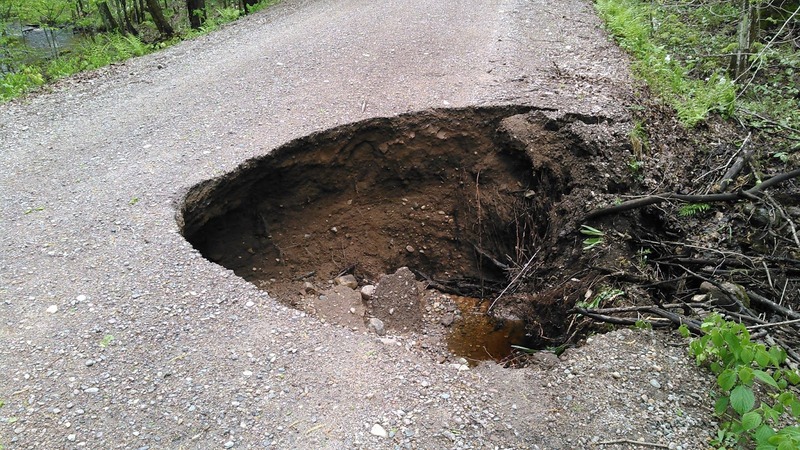 Trail Closed: Setting Lake Road/Trail (off of Sawyer Lake Road) is closed due to a washout, Use Rose Lake Road instead. Throughout the beginning of this week there will be a small trail closure in the Town of Brazeau. There will be a detour on the town road to get you through the area. 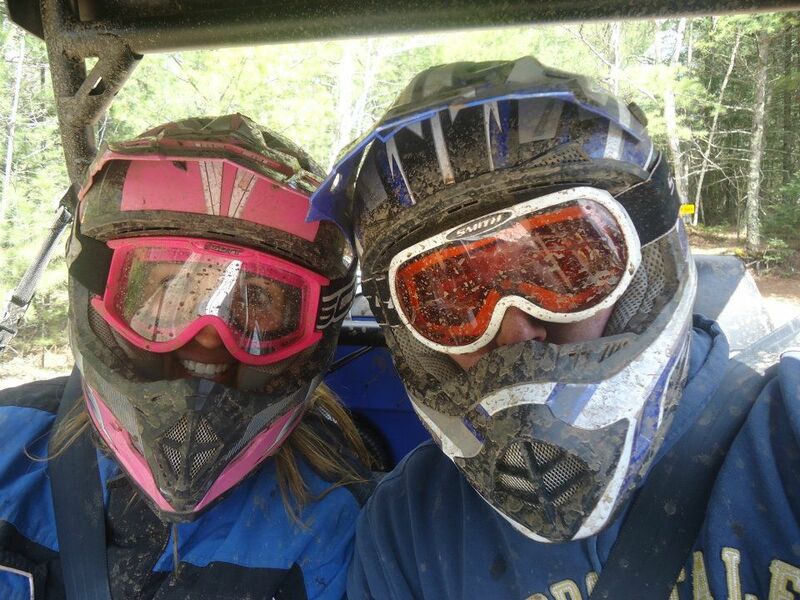 The Oconto County ATV/UTV trail system is open for the season. To request a free map, click here! The Oconto County ATV/UTV Trail System will open Friday, April 28, 2017! The Oconto County ATV/UTV Trail System will open Friday, April 28th (weather permitting). Continue to check back for updates here! Trails are CLOSED starting Monday, March 6, 2017. Townsend - Red Arrow Snowmobile - ATV Club - On Monday March 6th, 2017 the Red Arrow and surrounding trail systems will CLOSE FOR THE SEASON. Not just northern Oconto County but all of Forest County as well. Trails now are in POOR TO VERY POOR RIDING CONDITION! If you want to beat the snot out of your machine this weekend go and ride the gravel on the grade, the rocks and the slush of what's left on the trails. Lakewood - Paul Bunyan Snowmobile Club - The Lakewood area is getting some lite snow today. The trails are in poor condition with lot of bare spots and standing water. The temperatures for the weekend are predicted to be near 50 degrees. All grooming has stopped at this time. If you do ride watch low areas because there is a lot of water and slush. Bagley and Brazeau - Joyriders Trails - CLOSED. Chute Pond Snowmobile Club - Chute Pond trails are open, and are in poor "late season" condition. Riding is not recommended at this time. Trails will close at 6:00 am on Monday, March 6, 2017. Expect many thin and bare areas, some rocks and gravel, and some significant wet areas in the low spots. Gillett Sno ATV Riders - CLOSED. Oconto Falls - Sno Jokers Trails - CLOSED. Lena Snow Drifters - CLOSED. Machickanee Ski Trails - The Blackberry Ramble and the Brehmer Creek trails were groomed this morning. The Blackberry Ramble is in pretty good condition with a few thin spots. The Brehmer Creek Trail is OK but is rough in the areas that logging was going on. Look the hills over before going down. Coral Berry and Timberwolf Trails are not being groomed at this time because of logging operations in the area. Townsend - Red Arrow Snowmobile - ATV Club - We must have lost 1?-1 1/2? of snow today. The Nicolet is starting to look pretty bare again. Not quite where we were before the storm, but not far from it. With rain in the forecast for tomorrow that just might get us there. If you want to beat up your machines, go for it. Granted that in the woods some trails may not be bad, but you need to get to them. I won't be out riding with mine till we get more snow. Grooming is over for now. I rate our trails as in POOR RIDING CONDITION. Chute Pond Snowmobile Club - Chute Pond trails are open, and are in poor to fair "early season" condition. Expect some thin or bare areas, some rocks and gravel popping up through the snow, and some significant wet areas in the low spots. In general, the western wooded trails are better than the eastern wooded trails, and the NST is a mixed bag of some good, some not so good. ALL LAKES SHOULD BE CONSIDERED UNSAFE at this time because of deteriorating ice along the shorelines. Please ride with caution and enjoy our trails. Townsend - Red Arrow Snowmobile - ATV Club - We have received 4?-5? of snow so far with more forecast for this afternoon and night. We went for a snowmobile ride this morning to see if it is safe to groom the low lying areas. We will go out and groom our entire trail system tonight. Expect early season riding conditions with some gravel on the Nicolet and large rocks showing up in the hills and low spots southwest of town. On many trails we are basically starting all over again, so be careful! Our sister club to the south told me they will be grooming the grade and a few other trails as well and not grooming some trails because of to much water in some areas and fear of getting a groomer stuck. Lakewood - Paul Bunyan Snowmobile Club - The Lakewood area received 4 to 5 inches of heavy wet snow with a possibility of a little more. The trails lost most of the great base we had so there will be rocks and ruts like early season condition except the ground was still frozen and with the high temperatures there is a lot of standing water. We are going to try to groom some of the high areas but not near any swampy areas. Use extreme caution if you ride. Chute Pond Snowmobile Club - Chute Pond trails are open, and we are not grooming at this time. With the fresh snowfall, our trails are in mostly poor to fair very early season condition. Additional snow today would help improve trail conditions. If the weather forecast comes true and we actually do get the 4-8" or the 8-12" of snow through tonight, trails may or may not get groomed, but they will still be in very early season riding condition, with some significant wet areas in the low spots. ALL LAKES SHOULD BE CONSIDERED UNSAFE at this time because of deteriorating ice along the shorelines. Please ride with caution if you head out onto the trails. Townsend - Red Arrow Snowmobile - ATV Club - As of now our trails are not rideable. Snow and cold are necessary for that and we have had neither. Chute Pond Snowmobile Club - Chute Pond trails are open, and we are not grooming at this time. Our trails will remain open for now in mostly poor/unrideable condition, and we do not recommend riding them until we get more snow. If the weather forecast comes true and we actually do get the 4-8" or the 8-12" of snow tonight through tomorrow night, trails may or may not get groomed, and they will be in very early season riding condition. Please ride with caution if you head out onto the trails. Townsend - Red Arrow Snowmobile - ATV Club - It's 5:00 AM, 24 degrees in beautiful downtown Townsend, and the trails are freshly groomed!! Life is good. The trails are still in VERY GOOD CONDITION but watch for icy corners and stretches. Lakewood - Paul Bunyan Snowmobile Club - Trails are in great shape with a little ice on some of the corners. Hopefully the area will receive the much needed snow that is in the forecast. I will update after Tuesday night. Bagley and Brazeau - Joyriders Trails -Trails are back open on Feb 1st at 7:00am. They are in good condition but there is a problem on the Butler Springs trail. Logging has been taking place on Butler Springs Rd and will continue for the next few weeks. The loggers removed most of the snow on the trail. Since it has snowed the groomer drivers have been out on this trail trying to re-groom it. We don't know if the loggers will come back and take off the new snow that has recently fallen. If you are familiar with the ATV trail that runs next to the snowmobile trail, through Butler Springs, you, can use this trail. If we continue to have a problem with keeping it groomed, we plan to start grooming the ATV trail. Also we have problems grooming in other areas with thin ice. On the Pipeline and a few other areas the ice is to thin for the groomer to groom but safe for snowmobiles to ride. Gillett Sno ATV Riders - Trails are in very good condition. Groomers were out Tuesday and groomed again today. 2-3 inches of snow expected for Saturday. Should be great trail riding for a while. Chute Pond Snowmobile Club - Chute Pond trails are open, and we are grooming on a regular basis. Our trails are in good condition, with an icy base- which with normal traffic gets exposed in and around the corners. Please be aware that the groomers may be out day and night as needed to keep the trails in shape. Please watch out for the groomers, and give them space when you see them. Expect a few rough and bare spots, possibly some standing water and slushy spots, and probable icy areas, especially near the corners. Please ride with caution- and stay on the marked trails. Enjoy your ride. Oconto Falls - Sno Jokers Trails - Trails are OPEN. Lena Snow Drifters - Trails are open and in fair to poor condition. Won't be grooming until we receive more snow. Townsend - Red Arrow Snowmobile - ATV Club - Brrrrrrrrrrr!! it's -3 degrees this morning in beautiful downtown Townsend, and the trails are in VERY GOOD RIDING CONDITION. They look like they froze down nicely. Just remember that under that fresh snow is some ice, so be careful. Lakewood - Paul Bunyan Snowmobile Club - The trails are groomed and are in very good to excellent condition. We will be grooming all weekend long. Have fun on the trails but watch out for ice on the corners. Chute Pond Snowmobile Club - Chute Pond trails are open, and grooming on a regular basis. Our trails are in good condition, with an icy base- which with normal traffic gets exposed in and around the corners. Townsend - Red Arrow Snowmobile - ATV Club - The trails groomed out beautifully last night. With the new fallen snow (3?-4?) and the colder weather the trails are in GOOD TO VERY GOOD riding condition. They look like they froze down nicely. It's cold out again and the trails should hold up well. Just remember that under that fresh snow is some ice, so be careful. Lakewood - Paul Bunyan Snowmobile Club - The Lakewood area got about 2 inches of fluffy snow with a little more coming down. Later today the groomers will be out getting the trails back in shape. Remember there is a lot of ice under the fresh powder. Bagley and Brazeau - Joyriders Trails -Trails are back open on Feb 1st at 7am. They are in good condition but there is a problem on the Butler Springs trail. Logging has been taking place on Butler Springs Rd and will continue for the next few weeks. The loggers removed most of the snow on the trail. Since it has snowed the groomer drivers have been out on this trail trying to re-groom it. We don't know if the loggers will come back and take off the new snow that has recently fallen. If you are familiar with the ATV trail that runs next to the snowmobile trail, through Butler Springs, you, can use this trail. If we continue to have a problem with keeping it groomed, we plan to start grooming the ATV trail. Also we have problems grooming in other areas with thin ice. On the Pipeline and a few other areas the ice is to thin for the groomer to groom but safe for snowmobiles to ride. Gillett Sno ATV Riders - Trails are open and in poor to fair condition. Lena Snow Drifters - Trails are CLOSED. Townsend - Red Arrow Snowmobile - ATV Club - We received 2?-3? of fresh snow since yesterday and the groomers will be out later today. It's cold out again and the trails should hold up well. Just remember that under that fresh snow is some ice, so be careful. Paul Bunyan has closed the stretch of trail behind Backwoods Bar because of water. They broke through with their groomer last Friday. So to get through to Burnt Dam Rd. you have to ride around the corner on Sawyer Lake Rd. and jump back on the trail. The Red Arrow system is in GOOD TO VERY GOOD riding condition. Chute Pond Snowmobile Club - Chute Pond trails are open, and grooming on a regular basis. Our trails are thin, with a very icy base- which with even light traffic gets exposed in and around the corners. The Nicolet State Trail (railroad grade) is in poor condition south of Breed, and in fair to good condition north of Breed. Wooded trails west of Hwy 32 are in groomed and in fair to mostly good condition- wooded trails east of Hwy 32 are still a work in progress. Groomers are trying to improve their condition- but for now they're in poor to fair condition, with some areas better than fair. Please be aware that the groomers may be out day and night as needed to get the trails back into shape. Please watch out for the groomers, and give them space when you see them. Expect some rough and bare spots, some standing water and slushy spots, and probable icy areas, especially near the corners. Please ride with caution- and stay on the marked trails. Oconto Falls - Sno Jokers Trails - Trails are CLOSED. 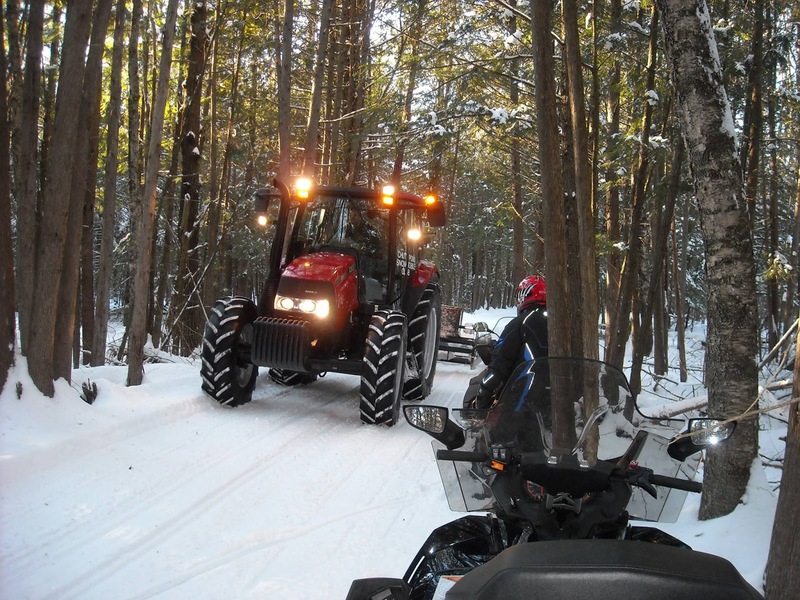 Townsend - Red Arrow Snowmobile - ATV Club - The trails are in GOOD TO VERY GOOD riding condition thru the Red Arrow system. Bare in mind that there are icy spots and an occasional rock, but overall considering what we have been through, there is some darn nice riding to be had. Some of the snow has become sugary in some areas, but not to worry the weather man is calling for some fresh snow on Monday. Lakewood - Paul Bunyan Snowmobile Club - All trails groomed out great last night. There are a few thin areas but overall are in good to very good condition. There is a water problem behind Backwoods Bar & Grill off county T.
Gillett Sno ATV Riders - Trails are in poor condition. We will not be grooming until we receive more snow. We ask that people stay off the trails until we get more snow and cooler weather. Townsend - Red Arrow Snowmobile - ATV Club - Nothing has really changed since yesterday. We received about 1? of snow from yesterday's storm. The temperature is even the same! GROOMING WILL RESUME TONIGHT, as it is supposed to get colder again. The trails are in GOOD TO VERY GOOD CONDITION, but be aware of icy spots and maybe some slush in low lying areas. Langlade County will reopen Sections A&B tomorrow morning at 8:00. Read yesterday's report for more details. Lakewood - Paul Bunyan Snowmobile Club - The Lakewood trails as well as all other area trails are very soft and slushy. We are asking riders to please stay of the trails until the temperatures drop below freezing. We will be in the upper 30's into the 40's for the weekend. I know this is the last thing you wanted to hear after a great weekend of riding last weekend. We will not be grooming until further notice. Gillett Sno ATV Riders - Gillett Trails remain open with good to excellent riding conditions. We are out grooming several times a week. Just a reminder the Gillett Shell Station to the Chuck Wagon is closed. There is a marked trail along Highway 32 to get to the Wildfire Hotel and Bar that is it. Please stay on marked trails. Chute Pond Snowmobile Club - Chute Pond trails are open, and grooming will resume Thursday, January 26th. Please be aware that with colder nighttime temperatures, the groomers may be out day and night as needed to get the trails back into shape. Please watch out for the groomers, and give them space when you see them. Expect some rough and bare spots, some standing water and slushy spots, and possible icy corners. We appreciate everyone's cooperation with staying off the trails during the January thaw, and we look forward to seeing you out enjoying our trails again! Townsend - Red Arrow Snowmobile - ATV Club - It's 35 degrees as I type this right now. The trails are very sloppy but there is still a base to ride on when it gets cold again. The forecast is for up to 2?-4? of wet heavy snow tonight into Wednesday, that would be great if it comes to pass. It still isn't going to drop below freezing until late Thursday. If that happens THE GROOMERS WILL BE OUT AGAIN! If what they say comes to pass we should have a decent weekend of riding. I can't provide you with conditions until the snow and cold make their scheduled appearances. By tomorrow I should know better where we are at! Please continue to stay off the trails until they firm up again, the weekend should be just fine. Bagley and Brazeau - Joyriders Trails -Trails are CLOSED. Chute Pond Snowmobile Club - Chute Pond trails are open, but riding is discouraged at this time. The good news is- the thaw is almost over. With colder temperatures and some fresh snow in the forecast, our groomers are on standby- once it cools down, the trails will be groomed and ready for the weekend. If the forecast is correct, grooming should start Wednesday night or Thursday. We appreciate everyone's cooperation with staying off the trails during the January thaw, and we look forward to seeing you out enjoying our trails again- soon! Townsend - Red Arrow Snowmobile - ATV Club - It's 41 degrees as I type this report for you and the trails are turning to mush. The forecast is for temps in the upper 30's into the 40's for the next 7 days with the possibility of some rain or freezing rain later in the week. Riding on the trails now will only destroy our wonderful base that's been established over the last couple of snow storms! Rule of thumb again is: If your yard is sloppy and mushy, the trails will be too!! We won't be able to groom until the temps settle down once more. Bagley and Brazeau - Joyriders Trails -We will be CLOSING the trails Wednesday 1/18/2017 7:00AM. We are trying to save the trails and get colder weather to open them back up. Chute Pond Snowmobile Club - Chute Pond trails are open, but riding is discouraged at this time. With forecasted temperatures approaching 40 with possible rain, we are asking that you use common sense- and stay off the trails until the temperatures drop back down. We believe the trails will withstand this January thaw- your cooperation will help make this happen. Townsend - Red Arrow Snowmobile - ATV Club - It's 32 degrees as I type this today. We also picked up 1 1/2?-2? of snow last night while many of you are still fighting the ice. What a difference a couple of days make! The trails are in VERY GOOD condition YET! We groomed the bad spots yesterday so they can freeze down flat again when the cold decides to return. The rest of the trails are just fine with the exception of some of the potholes in the hills that just need a little more snow to fill them. During this warm spell please try and stay off the trails when the temperature is above freezing. It will only do damage to our wonderful base! Rule of thumb: If your driveway and yard are sloppy, so are the trails!!! Lakewood - Paul Bunyan Snowmobile Club - The groomers were out Sunday night smoothing out the trails before the expected coating of ice later today and into Tuesday. Trail boss Jack Bailey said they groomed out very good. We are asking if the temperatures go into the mid to upper 30's you stay off the trails to save the base for the future. Hopefully the rain stays south of Green Bay. Congratulations to the Packers on a awesome win. I will update what and how much precipitation we receive. Ride Safe !!! Chute Pond Snowmobile Club - Chute Pond trails are open, being groomed when possible, and in good condition. Last night we got about 1/2" of freezing rain. The next 7 days of weather don't look very nice for our trails, either. With forecasted temperatures approaching 40 with possible rain, we are asking that you use common sense- and stay off the trails until the temperatures drop back down. We believe the trails will withstand this January thaw- your cooperation will help make this happen. Bagley and Brazeau - Joyriders Trails - 9 inches of new snow, the trails will be groomed Wednesday and Thursday all but some marshes still need to freeze up. The groomer drivers said the trails are still very good in many areas after the weekend and before the new snow. Can you help us out when you ride in the areas not groomed pack down the outside of the trails not just stay in the middle of it, this will help freeze them up. Chute Pond Snowmobile Club - Chute Pond trails are open, being groomed, and in good condition. Our groomers will be out for the next several days working on the 7-9 inches of fresh snow we got today, with more on the way tomorrow. Overall trail conditions will improve once the groomers are able to cover the entire trail system. Use caution and watch for the groomers, who could be out on the trails at any hour of the day or night. Once the groomers catch up with all the fresh snow, we'll update with any possible problem areas. Until then, enjoy your ride and please ride sober and safe out there. Lena Snow Drifters - Trails are open. Chase Sno-Chasers - Trails are open. Townsend - Red Arrow Snowmobile - ATV Club - It's -11 degrees as I type this report, so I guess it's safe to assume the trails are hard and fast this morning! The trails in the greater Townsend area are in VERY GOOD to EXCELLENT riding condition. Enjoy this weekend because the extended forecast is nasty with temps in the mid to upper 30's, maybe 40 by next weekend. So dress warm today and appreciate the cold, next week you might wish we had some of it back. The groomers will be out both tonight and Saturday night as well, so enjoy and watch out for those diesel breathing monsters over the next hill come night time. Lakewood - Paul Bunyan Snowmobile Club - The Lakewood area has already received 7 inches so far and its still snowing. We will have the groomers out in the morning to get the trails in shape. There is going to be strong winds tonight that may bring down some trees so we will be able to clean them up at the same time. Trails are as very good to excellent. We will be grooming all week. Gillett Sno ATV Riders - Grooming now and trails will open at noon today 1/10/2017. Oconto Falls - Sno Jokers Trails - Trails are open and groomed for the weekend! Lakewood Cross Country Ski Trails - 11 Degrees Lots of fresh snow. Trail groomed but no track set. Townsend - Red Arrow Snowmobile - ATV Club - Why, it's snowing, 25 degrees and 7-8 inches of wet heavy snow in the forecast! What an addition to the base we already have this will make. So continue your snow dances, they appear to be working. Trails still are in GOOD to VERY GOOD riding condition. Stand by for updates. Till then! Lakewood - Paul Bunyan Snowmobile Club - The Lakewood area has already received 7 inches so far and its still snowing. We will have the groomers out in the morning to get the trails in shape. There is going to be strong winds tonight that may bring down some trees so we will be able to clean them up at the same time. I will report on trail conditions after the groomers get back in. Ride safe. Lena Snow Drifters - Trails are open and will be groomed tonight. Machickanee Cross Country Ski Trails - Updated trail information will be posted soon. Townsend - Red Arrow Snowmobile - ATV Club - It's -6? this morning in beautiful downtown Townsend. The groomers were out last night and the trails are back in GOOD to VERY GOOD riding condition. They froze down very hard and should hold up very well. There was heavy traffic in the area yesterday and I hope everyone had a good time. Get your riding in early today, I hear there's a football game this afternoon!! Lakewood - Paul Bunyan Snowmobile Club - All trails were groomed today and groomed out very good. We rate them as good. Ride safe and stay warm!!!! Bagley and Brazeau - Joyriders Trails - The trails are getting better, we have a good base and the snow we received Friday night and Monday night helped. The marshes still need time to freeze up, before we can groom them. Club member reported in this weekend and said the trails were fair to good condition in many areas. Snow is light on the east portion of the trail system, from Klondike north to White Potato Lake. Pipeline is in fair condition due to lack of grooming. Forest trails are fair to good. Gillett Sno ATV Riders - Trails are CLOSED. Chute Pond Snowmobile Club - Chute Pond trails are open and in "early season" condition, with possible icy areas, occasional exposed rocks, and some thin or rutted areas. There are some wet low spots that have not frozen up yet- or that have frozen up and have not been groomed smooth yet. Our groomer broke through a water hole on the north end of the pipeline trail on Thursday, January 5th- use extra caution in this area. Most of our trails have a smooth, flat, solid ice base with 1-2"" of snow cover on top of that base. We are grooming when possible. More snow will greatly improve our trail conditions. Areas we recommend you use extreme caution in until they freeze up completely and can be groomed properly: pipeline trail- rough with broken water holes, trail from Junction to pipeline- rough with broken water holes, Twin Pine road trail- rutted from vehicle tracks, 18 Corridor from Neligan Rd to Crooked Lake- rough swampy area. These areas have substantial wet & muddy areas which may or may not have frozen yet- either way they could possibly cause issues for you and your sled. Our trails are rideable, but they are still in early season condition- please use extra caution, especially in the areas listed above. Lakewood Cross Country Ski Trails - On the snow 10:10 6 degrees, off the snow 1:45 15 degrees. Great day to ski, low temps but no wind and well groomed trail. I classic skied between 6 and 17 K markers. Some debris in track. Bad in a few sections by the oaks but most of the track was good. Skate lane looked great. Machickanee Cross Country Ski Trails - With bad snow conditions and bitter cold temps predicted, we have decided to cancel the candlelight ski scheduled for this Saturday night (1/7). We really need some measurable new snow (4? - 6?) before we will be able to consider grooming. Townsend - Red Arrow Snowmobile - ATV Club - It's -5? this morning as I prepare this report. Yes the trails are in GOOD to VERY GOOD riding condition in the Townsend area. The groomers will be out later today and tonight, so watch out when approaching a blind hill so you don't get a big diesel breathing surprise. There are a lot of machines out today so be careful and considerate of others. Lakewood Cross Country Ski Trails - We groomed the entire trail system with the PB today. As we didn't groom the last 2 snowfalls until today we had 3 inches of snow on top of a hard packed base. We set one track the entire length of the trail. The skating lane has really flattened out. Trail is in very good shape. Townsend - Red Arrow Snowmobile - ATV Club - We had about 4" of good wet snow Monday and it really helped the trails. Most of our system is rated good to very good, there are some hilly wooded spots that need more snow but generally are short sections and don't spoil your ride. Swamps are still a problem in some areas and we need the below zero temps the next few days to freeze them so groomers can groom them. Compared to last year we are having a great start. Lakewood - Paul Bunyan Snowmobile Club - The Lakewood area received about a inch and a half of fluffy snow. It will provide much needed lubrication for the slides. Watch for icey corners and rocks and ruts. We rate the trails as fair to good. Gillett Sno ATV Riders - No update since last report. We got 2" of packy snow last night, and it's just what we needed to make our trails rideable again. Most of our trails have a solid ice base with 2-4" of snow cover on top of that base. We are grooming when possible. After this week's deep freeze we should be able to groom all low and swampy areas. Areas we recommend you avoid or use extreme caution in until they freeze up completely and can be groomed properly: pipeline trail- rough with broken water holes, trail from Junction to pipeline- rough with broken water holes, Twin Pine road trail- rutted from vehicle tracks, 18 Corridor from Neligan Rd to Crooked Lake- rough swampy area. These areas have substantial wet & muddy areas which may or may not have frozen yet- either way they could possibly cause issues for you and your sled. Our trails are ride-able, but they are still in early season condition- please use extra caution, especially in the areas listed above. Townsend - Red Arrow Snowmobile - ATV Club - It got cold night before last and froze the slushy trails very hard rutty and dangerous. We decided to take the groomer out and see if we could cut it down and minimize the dangers. We were pleasantly surprised to see that the trails groomed out very well! The ruts seemed to have filled in for the most part nicely. The east side of 32 was groomed late yesterday and I would rate as FAIR to GOOD. 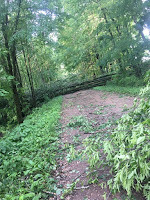 The Nicolet State trail suffered the most damage from the storm, but is still in FAIR condition, with some gravel having worked it's way into the mix. The west side or 32 was groomed overnight while we slept, and held up pretty well, having the cover of shade. After grooming down the slushy ice ruts, I would have to say I rate these trails as FAIR to GOOD as well. BEWARE of icy corners and any rocks that might have shown themselves after the warm spell. Remember these are still early season riding conditions! Bagley and Brazeau - Joyriders Trails - The trails are open but the rain and 45 degree temps hurt the trails. There is water in low areas that needs to freeze up again. No groomers will go out until we receive 3 or more inches of new snow. Remain off the lakes due to unsafe conditions. Chute Pond Snowmobile Club - Chute Pond trails are open and in poor "early season" condition, with many icy areas, some exposed rocks, some thin or bare areas. There are some wet low spots that have not frozen up yet- or that have frozen up and have not been groomed smooth yet. We have stopped grooming until we get more snow. Trails where the groomers went before the freeze-up, there is little to no loose snow and trails are icy and hard. Where the groomers did not go before the freeze-up, trails may be rutted, with icy patches in the low spots. Many areas have fallen trees or branches- we are working to clear these off the trails. Riding is not recommended until we get more snow. Areas we recommend you avoid or use extreme caution in until they freeze up completely and can be groomed properly: pipeline trail, trail from Junction to pipeline, 18 Corridor from Neligan Rd to Crooked Lake. These areas have substantial wet & muddy areas which may or may not have frozen yet- either way they could possibly cause issues for you and your sled. Chute Pond is mostly frozen on top of the ice, and is very slippery. Use extra caution if you ride on any lake this early in the season. If you choose to ride, please use extra caution. The icy trails now will be a great trail base for the rest of the season- but it's not very nice out there right now. Townsend - Red Arrow Snowmobile - ATV Club - Well the wind and the 40's are gone, but so is the nice smooth base we had laid down on the trails. Those who chose to ride yesterday did alot of damage. Those ruts in the slush have now turned to hard ruts to get your skis caught in and lose control if your not careful. The Nicolet State trail ( The Grade ) got the worst of it because of the heavy traffic and the exposure to the sunshine. I would rate it at Fair at best. The wooded trails took a beating as well but held up better because of the shaded sunshine. They are still filled with slush holes and ruts caused be the folks who chose to ride yesterday now that they have frozen down. I will rate them as Fair as well. Chute Pond Snowmobile Club - If you avoid riding trails when they are wet and slushy, it will help preserve the trails for later when temperatures drop and more snow falls. Chute Pond trails are open and in poor "early season" condition, with many slushy areas, some exposed rocks, some thin or bare areas, and some wet low spots that have not frozen up yet- or that have frozen up and have not been groomed smooth yet. We have stopped grooming until we get more snow. Riding is not recommended until we get more snow. Areas we recommend you avoid or use extreme caution in until they freeze up and can be groomed properly: pipeline trail, trail from Junction to pipeline, 18 Corridor from Neligan Rd to Crooked Lake. These areas have substantial wet & muddy areas which may or may not have frozen yet- either way they could possibly cause issues for you and your sled. Chute Pond has a lot of water and slush under the snow on top of the ice. Use extra caution if you ride on any lake this early in the season. To help us preserve our trail base, please wait for more snow before riding our trails. Townsend - Red Arrow Snowmobile - ATV Club - The guys were out grooming the west side of 32 along with the Nicolet State Trail last night and panned down the snow we received the other day. I'm pleased to report things are about the same as yesterday as far as conditions. I'm sure we lost some snow to the warm temperatures though. The trails east of town remain in "GOOD" riding condition and the west in "FAIR to GOOD". Remember the season as well as the trails are young yet and will only get better. Watch for rocks and ruts. There is snow in the forecast for today, will see what we get. Maybe enough to account for the amount we stand to lose in the Christmas storm with rain in the forecast. Lakewood - Paul Bunyan Snowmobile Club - The area received 3 inches of snow Wednesday. We groomed some of the main trails but there is not a whole lot to work with. The Christmas day forecast does not look good with the temps in the upper 30's and rain. We will update you on the conditions Sunday. The Paul Bunyan Riders would like wish all our members a Merry Christmas. If you ride watch out for ruts and rocks. Bagley and Brazeau - Joyriders Trails - The groomers went out the last two days, to pan the trails, only to find out that the swamps are not frozen enough to support the groomers. Because of this, the drivers will only groom the forest roads, fields and areas which are dry. This is what we need from you early riders, ride the trails that are not groomed as well and also ride the sides not just the center. This will help freeze up the trails. Trails not groomed are the pipe line, trail to Suring, Kelly Lake area, Lost lake swamp, the west side of White Potato lake. just to name some areas. Where is standing water in Some areas were the groomers broke thru the ice. Gillett Sno ATV Riders - Trails are open! Most trails are groomed or are going to be groomed. Use extreme caution when riding through the swamp over by club 32. The trail north of town goes to the gas station and Wildfire hotel and bar only and dead ends. we had to make changes cause the farmer doesn't want us in his field. With that being said the other end of the trail is open from the rail grade and connects with the trail to Oconto Falls from there there is no trail going to the shell station. Chute Pond Snowmobile Club - Chute Pond trails are open. Trails are in "very early season" condition, with some exposed rocks and some thin and wet low spots that have not frozen up yet. Most trails are panned- the main exception being the pipeline trail. Areas we recommend you avoid until they freeze up: pipeline trail, trail from Junction to pipeline, 18 Corridor from Neligan Rd to Crooked Lake, trail from Old 64 north to Bowman air strip, north of Hwy W near the old Pine Grove. These areas have substantial wet & muddy areas which could cause issues for you and your sled. Please use extra caution and courtesy as you enjoy our early season trails. Oconto Falls - Sno Jokers Trails - Oconto Falls trails will be open with the exception of the trail from Hazelnut lane to the river. We strongly advise against any river travel until ice conditions are safer. Also, we have not groomed yet so be aware of dangers that may be hidden under the snow. We hope to groom this coming week but as of now, there are swamps not frozen enough to support the groomer. Please tread lightly and stay on the trail. Lena Snow Drifters - The Lena Snow drifters trail system is open! Only exception is where the trail crosses county J and Logtown road due to standing corn. Groomers are out but expect early season trail conditions. Wet areas and thin snow on plowed fields. Townsend - Red Arrow Snowmobile - ATV Club - Trails are open! Be careful, it's early season riding, it is far from perfect but it is riding. Be careful for an occasional rock and some ruts. They filled in pretty well while grooming but be on guard. The east side of Townsend trails are nicer right now mainly because of the lack of big rocks. The west side is decent but be alert for rocks and ruts. Things looked very beautiful with the new fallen snow on things yesterday while grooming. Lakewood - Paul Bunyan Snowmobile Club - The trails were groomed on Saturday and will open for the 2016-2017 season at 8 am Sunday December 18th. The trails are in very early season condition. Watch for ruts and rocks until we get more snow to work with. Ride safe!!! Townsend - Well your Snow Dances worked, We received about 8?-10? of snow from the big storm depending which area you were in because it varied yesterday throughout the system I noticed while grooming. Enough of the small talk, because this is what you want to hear. THE TRAILS OPEN TODAY! Be careful as I said Friday, this is early season riding, it is far from perfect but it is riding. Be careful for an occasional rock and some ruts. They filled in pretty well while grooming but be on guard. The east side of Townsend trails are nicer right now mainly because of the lack of big rocks. The west side is decent but be alert for rocks and ruts. Things looked very beautiful with the new fallen snow on things yesterday while grooming. It got cold last night so hopefully the base on the trails should have frozen good and hard for riding today. Lakewood - The trails were groomed on Saturday and will open for the 2016-2017 season at 8 am Sunday December 18th. The trails are in very early season condition. Watch for ruts and rocks until we get more snow to work with. Ride safe !!! Chute Pond Snowmobile Club - Chute Pond trails are open. Trails are in "very early season" condition, with some exposed rocks and some thin and wet low spots that have not frozen up yet. Most trails are panned- the main exception being the pipeline trail. Areas we recommend you avoid until they freeze up: pipeline trail, trail from Junction to pipeline, 18 Corridor from Neligan Rd to Crooked Lake, trail from Old 64 north to Bowman air strip, north of Hwy W near the old Pine Grove. These areas have substantial wet & muddy areas which could cause issues for you and your sled. Please use extra caution and courtesy as you enjoy our early season trails. Bagley and Brazeau - The B & B Joyriders trails are now open today Dec. 17th @ 2:00pm. There is still one areas that is remaining closed, due to corn in a 40 acre field. This trail is from Cooley Lake to Hwy Z which heads to Suring or the Pipeline. The intersestion numbers are 407 to 415. This trail will reamain closed until next week sometime. We don't plan to bring out the groomers until Tuesay, Dec 20th. Please ride the trails cautiously. There could be many dangerous areas because the club has not been through the complete system due to wet area. Stay off all lakes. Remember this is very early season riding. Gillett - Most trails are groomed or are going to be groomed. Use extreme caution when riding through the swamp over by club 32. The trail north of town goes to the gas station and Wildfire hotel and bar only and dead ends. we had to make changes cause the farmer doesn't want us in his field. With that being said the other end of the trail is open from the rail grade and connects with the trail to Oconto Falls from there there is no trail going to the shell station. Oconto Falls - Please read entire post!!!! As of 1 pm today, Oconto Falls trails will be open with the exception of the trail from Hazelnut lane to the river. We strongly advise against any river travel until ice conditions are safer. Also, we have not groomed yet so be aware of dangers that may be hidden under the snow. We hope to groom this coming week but as of now, there are swamps not frozen enough to support the groomer. Please tread lightly and stay on the trail. Lena - The Lena Snow drifters trail system is open! Only exception is where the trail crosses county J and Logtown road due to standing corn. Groomers are out but expect early season trail conditions. Wet areas and thin snow on plowed fields. Chase Sno-Chasers - Trails are currently closed. Townsend - Red Arrow Trail Report: No trails are not open yet! We received about 3? of snow today, so that brings the amount on the ground to about 3 1/2?. I know we all want to ride but this near miss is a blessing in disguise. We need the cold that is in the forecast for this week more than snow at this time. The lakes, low lands, swamps, and just plain puddles on the systems need to freeze hard first to insure a great base for a good winter of safe riding. Hunting season needs to end also before we can open, that will be later this week. So continue your cold dance this week, then after that a very aggressive Snow Dance to follow until further notice. How does that sound? We probably need a good 12? of snow before the trail will be ride able, some good heavy flakes, not the light stuff! Keep checking back for updates loyal followers. Oconto Falls - Oconto Falls Sno Jokers Report: Sno Jokers trails are closed. Hopefully after colder weather this upcoming week the swamps will be passable. Still need more snow too. Snowstorm Aaron was just light fluffy snow and although it's better than nothing, it doesn't add up to much once packed down. Stay off the trails until they are open. When the snow starts to fall the Oconto County snowmobile trail conditions will be posted here or sent out via text message. Join our VIP text list today and receive important trail updates and events! 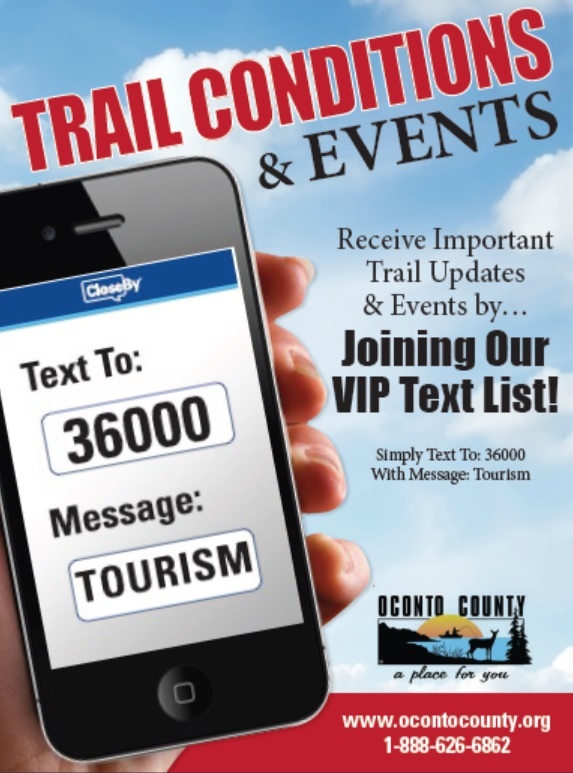 Simply text to: 3600 with message: Tourism. Click here for more Trail Reports.